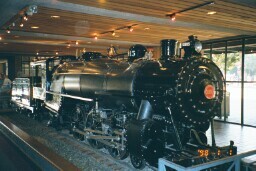 Locomotive 1915 in the lobby of the California State Railroad Museum. August, 2002. 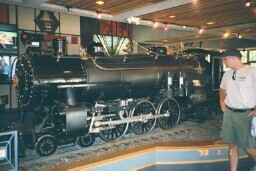 19" Pacific steam locomotive 1915 sits in the lobby of the California State Railroad Museum in Sacramento. 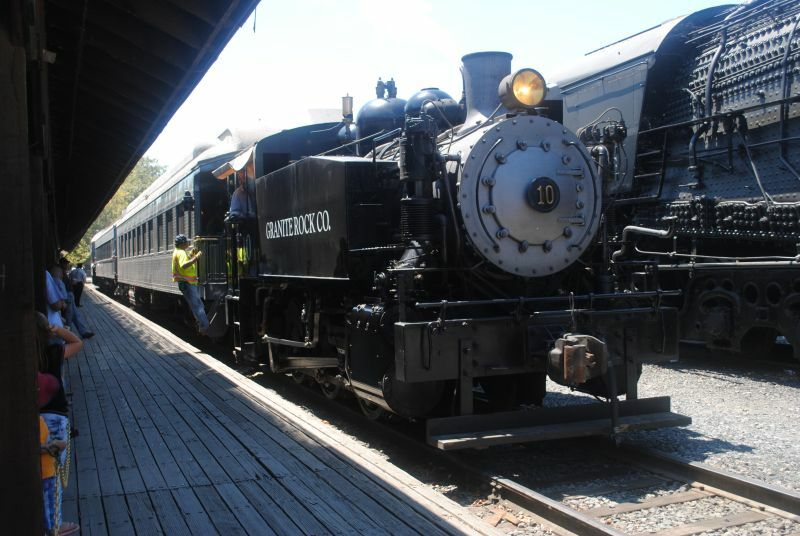 The locomotive never operated, but it was built by Louis MacDermot of Oakland, CA for the Overfair Railway at the 1915 Panama-Pacific International Exposition in San Francisco. The line was not a success because of poor location, rubber-tired competition, and a steep 10-cent fare. 1915, along with fellow Pacifics 1912-1914 and 0-6-0T 1500 and all the other rolling stock, went into storage on the grounds of MacDermot's Oakland home. 1913 ran at the Oakland Zoo for a short time in 1941, but soon went back to storage. 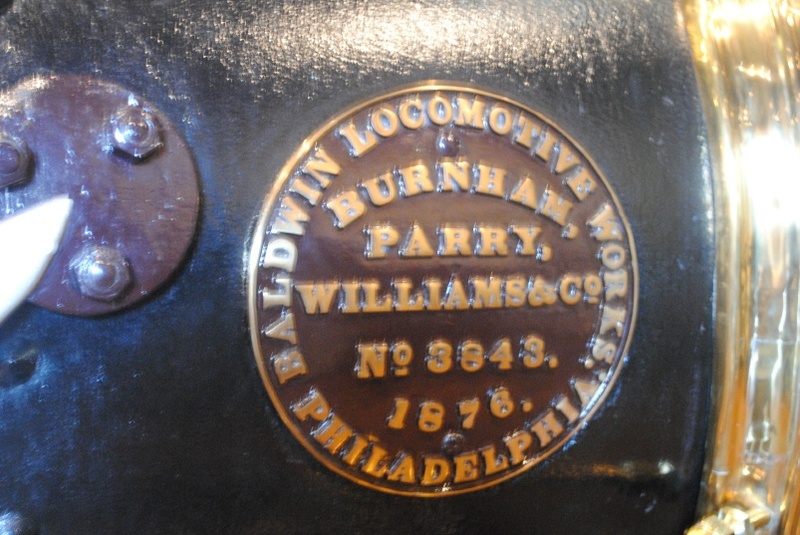 When MacDermot died in 1948, the famous Billy Jones bought the locomotives for his Wildcat Railroad. He regauged his line from 18 to 19", but the Pacifics were too long for the curves on the line, so Jones only operated 1500. The locomotives passed through various hands. 1912-1914 and 1500 wound up at Al Smith's Swanton Pacific Railroad, where they are still operated by the students of Cal Poly, San Luis Obispo. 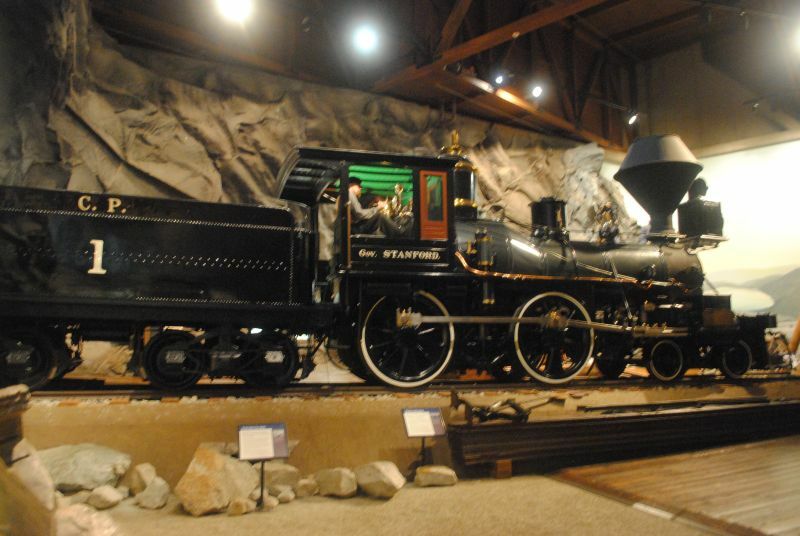 Smith donated 1915 to the California State Railroad Museum, where it has been on display since 1981. 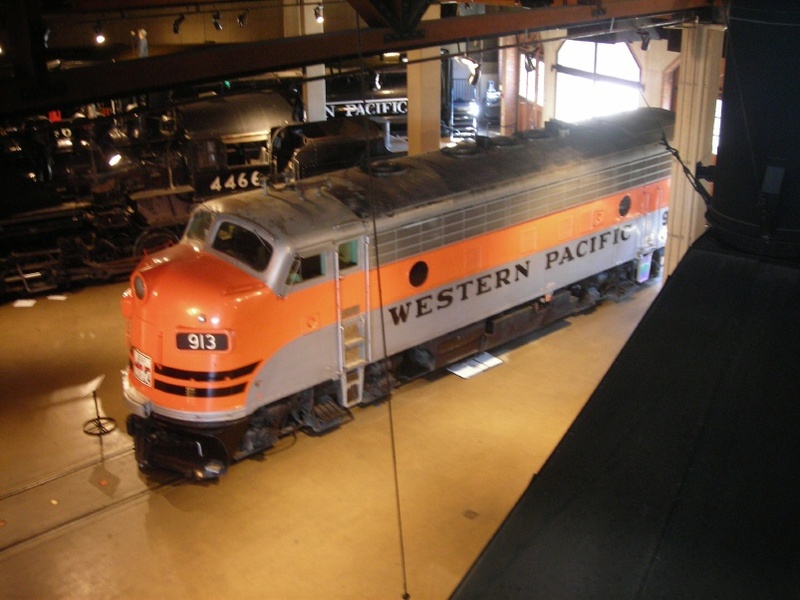 Visit the Museum of the City of San Francisco's excellent web site to read "From Panama to Poly; The Saga of the Overfair Railway Pacifics" by Walter Rice Ph.D. and Karl Hovanitz. We visited the museum in August, 2001. I couldn't get a good angle to take a shot of 1915. I managed to take a couple of shots in August, 2002. They were preparing to install a new exhibit about Walt Disney's backyard railroad, the Carolwood Pacific. 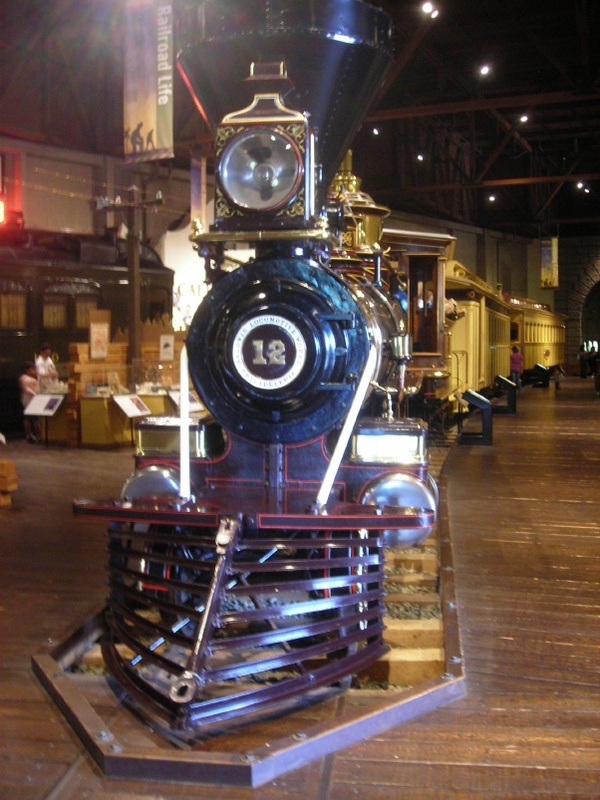 Another view of locomotive 1915 in the lobby of the California State Railroad Museum. August, 2002. 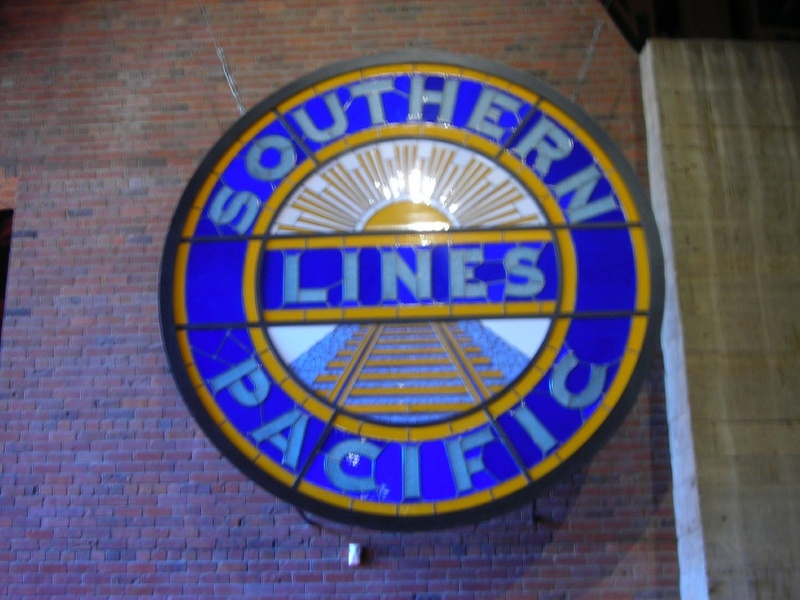 This stained glass window was preserved from Southern Pacific's Oakland Pier ferry terminal. September, 2007. After a pleasant stop at the Nut Tree, we continued up 80 to Sacramento. When we took the exit in West Sacramento, I was sad to learn that the Tower Bridge was closed for work. We took a long detour that led to 5. 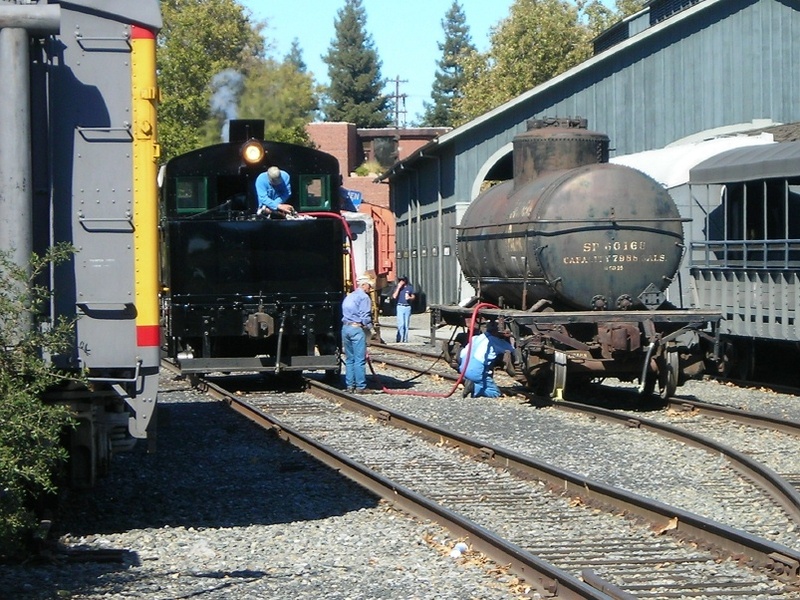 Eventually we got to the California State Railroad Museum. We found that the exhibits had been rearranged and augmented quite a bit since we had last visited. I liked the way the sleeping car and the diner had been moved together. Visitors enter at one end of the sleeping car, then cross a platform at the other end to the diner. Granite Rock 10, a sturdy 0-6-0T Porter built for the US Army in 1942. September, 2007. 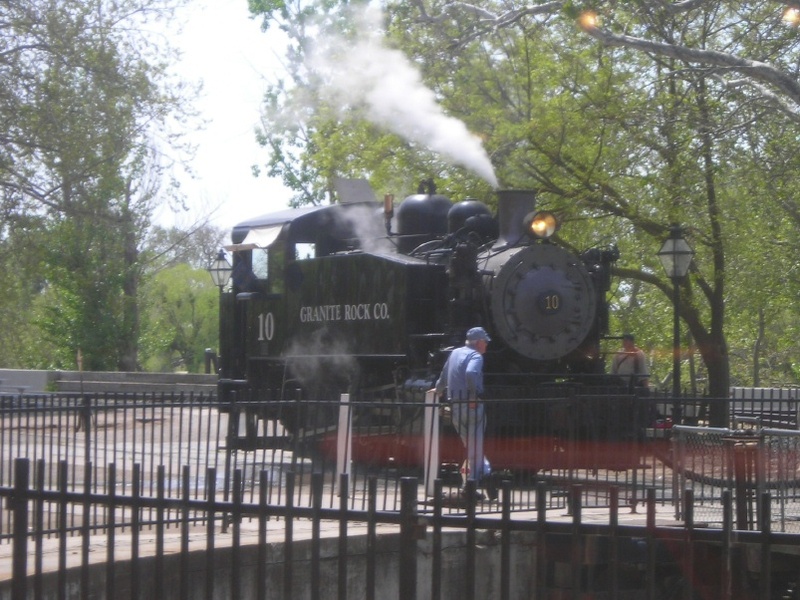 We went under the freeway to the K Street Mall for a late lunch, then went to the depot, where I was able to take photos and videos of the Sacramento Southern's Granite Rock locomotive number 10 taking water, switching, and leaving with the three o'clock train. Granite Rock 10 takes water from a tank car. September, 2007. 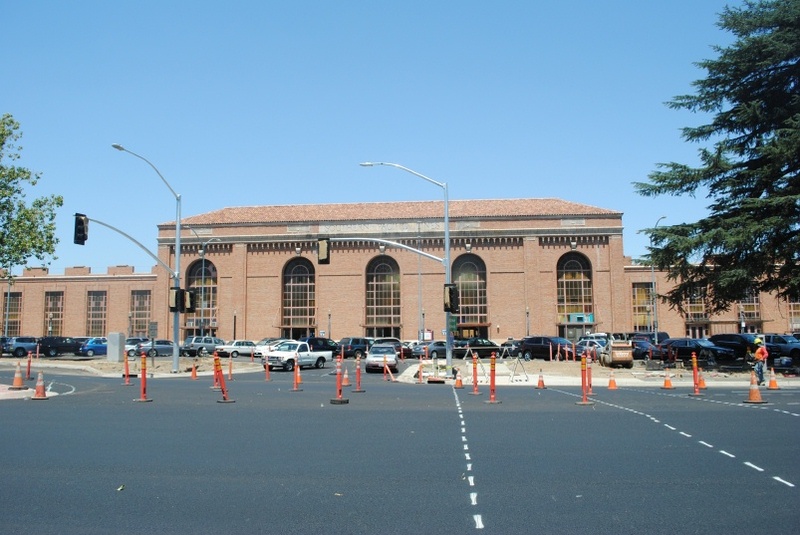 The sign out front shows the museum's symbol, the Central Pacific's bicycle locomotive, the Leland Stanford. November, 2008. 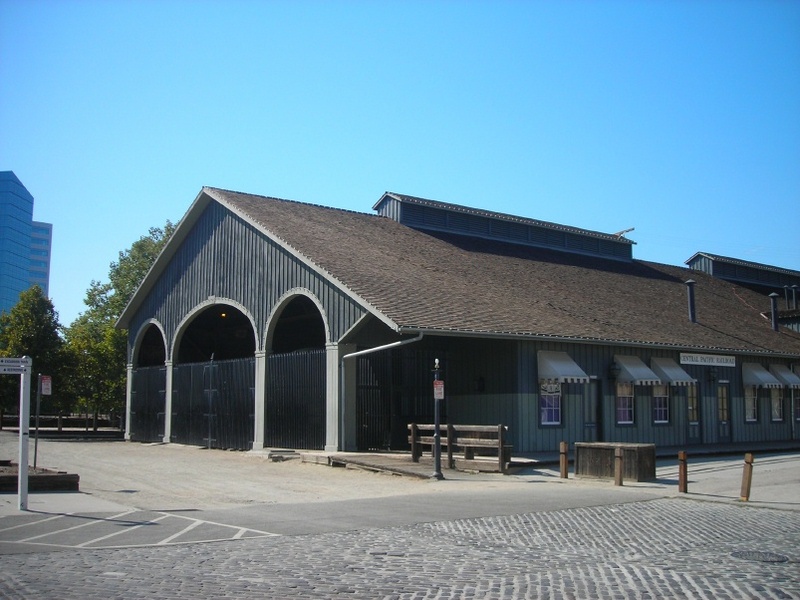 In November, 2008 we visited Old Sacramento and the California State Railroad Museum. On the way up, traffic was light except around Vacaville. It was cloudy all the way. There was not a big crowd at the museum. There was a nice exhibit of photographs taken around the Nevada Northern. The museum people appear to have finished the latest round of rearranging the exhibits. 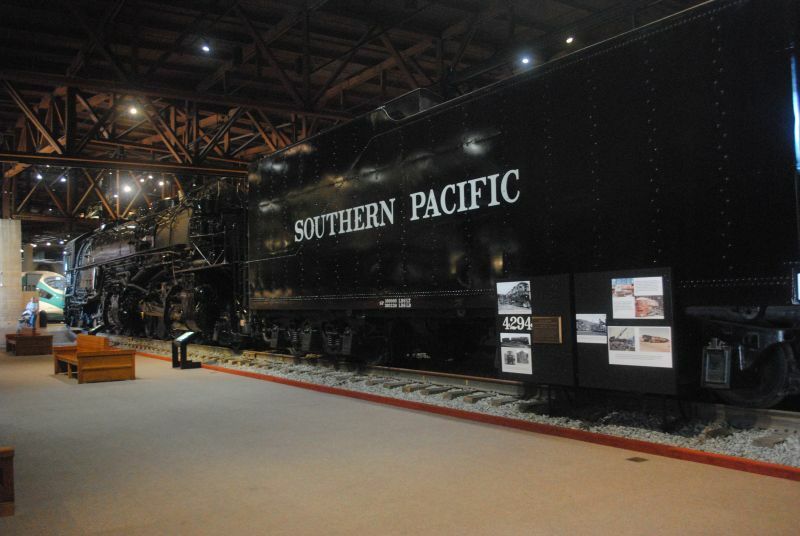 The reproduction of Central Pacific's arcade depot covers some of the equipment that won't fit in the museum. November, 2008. We went under the freeway and had lunch at Panda Express in the mall. Then the family went shopping. It started to rain lightly. 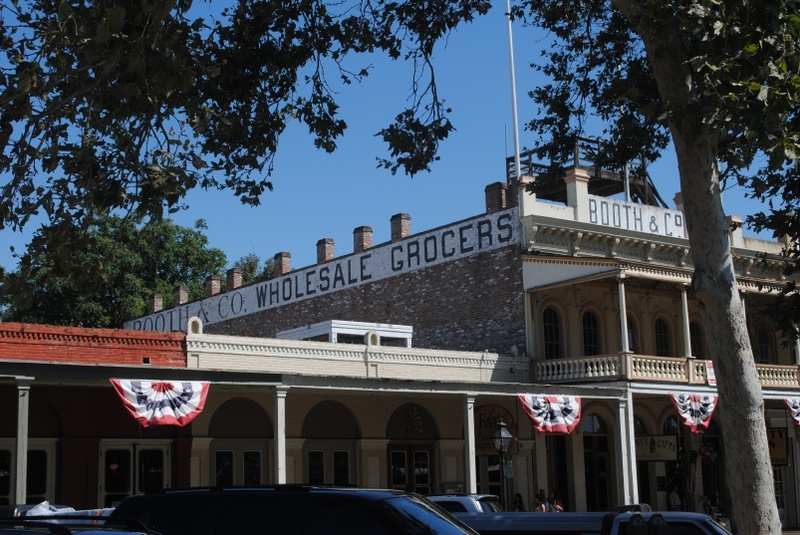 After, we went back to Old Sacramento and walked around a bit. Traffic was light on the way back except around Berkeley. 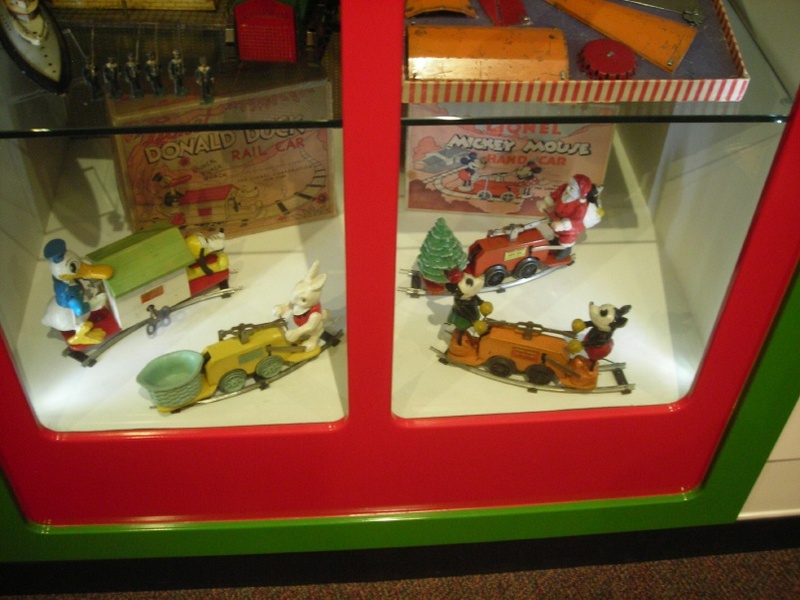 Lionel handcars with Disney and holiday characters, from the toy train area. November, 2008. 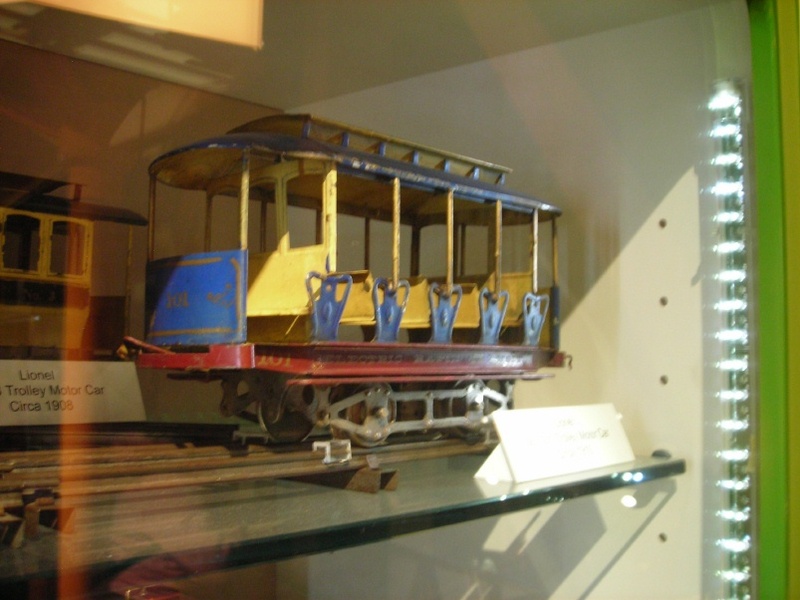 A Lionel open bench streetcar, from the toy train area. November, 2008. 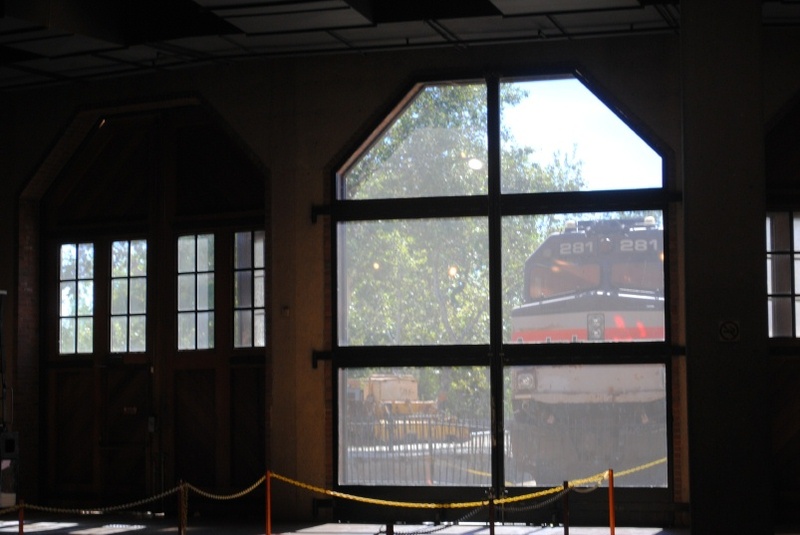 The reproduction of Central Pacific's arcade depot covers some of the equipment that won't fit in the museum. July, 2009. In July, 2009 we visited Sacramento. The California State Museum hosted the Library of Congress' exhibit "With Malice Towards None." 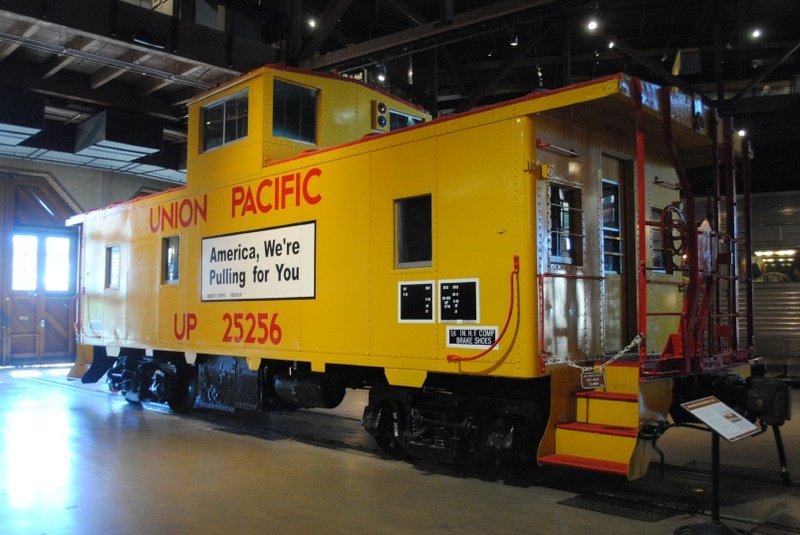 It had many Lincoln-related items, some from the Union Pacific collection. My heart felt funny when I saw the draft of the Gettysburg Address. There were many documents I have read about, like the unsent letter to General Meade after Gettysburg. They had the contents of Lincoln's pockets when he was shot, and the family doctor's notes, spattered with Lincoln's blood. I had only two issues with the show. One was probably due to the space: it was hard to follow the exhibits in sequence. There were little arrows all over the floor. The other was that, to protect the documents, the lights were very low. An older lady told me it was killing her eyes to try to read anything. I was having a similar problem. 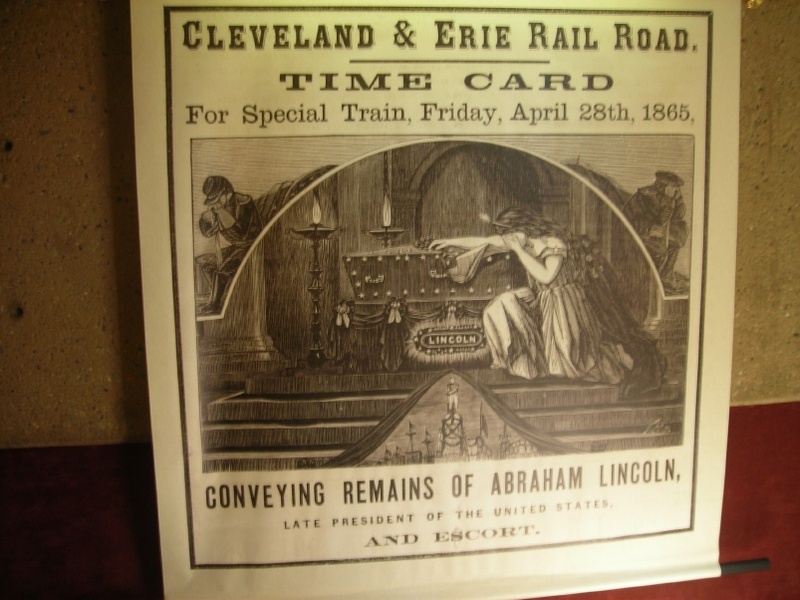 A reproduction of an Erie Railroad schedule for Lincoln's funeral train. July, 2009. 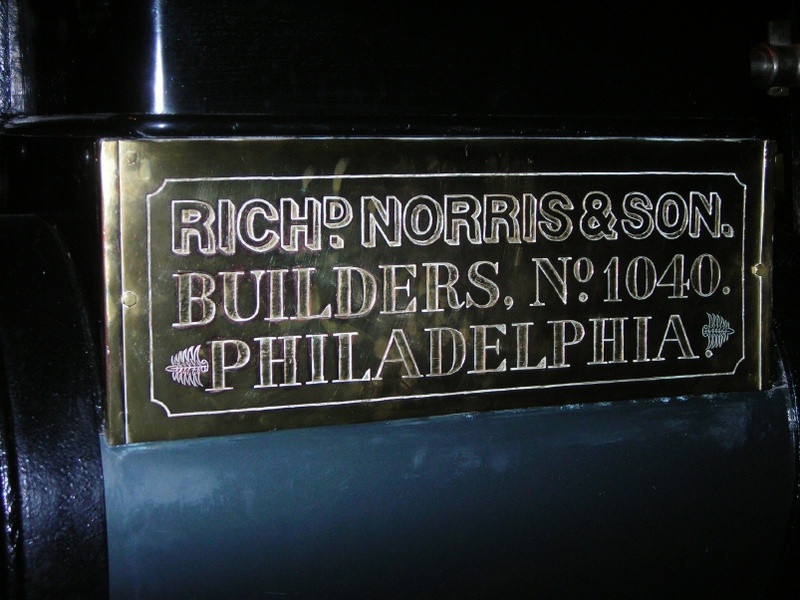 The Richard Norris & Son builder's plate on Central Pacific 1, the Governor Stanford. July, 2009. 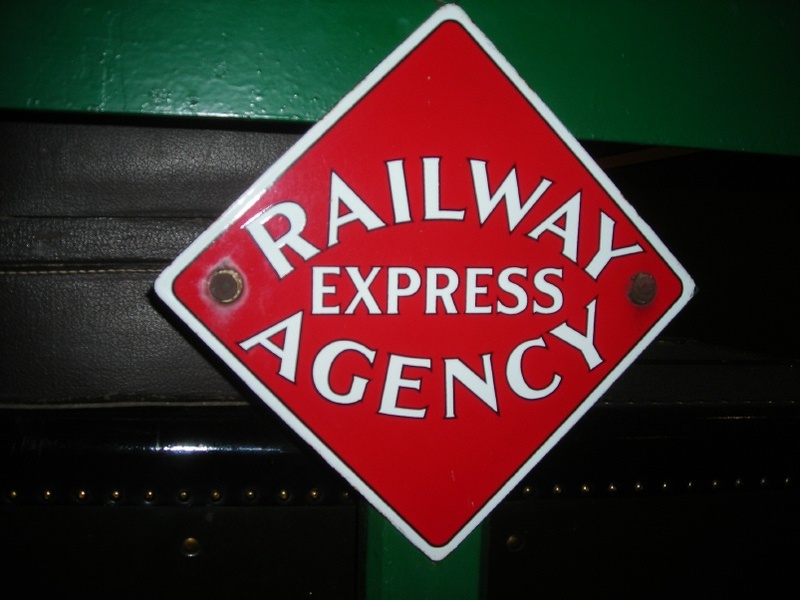 A Railway Express Agency sign. July, 2009. 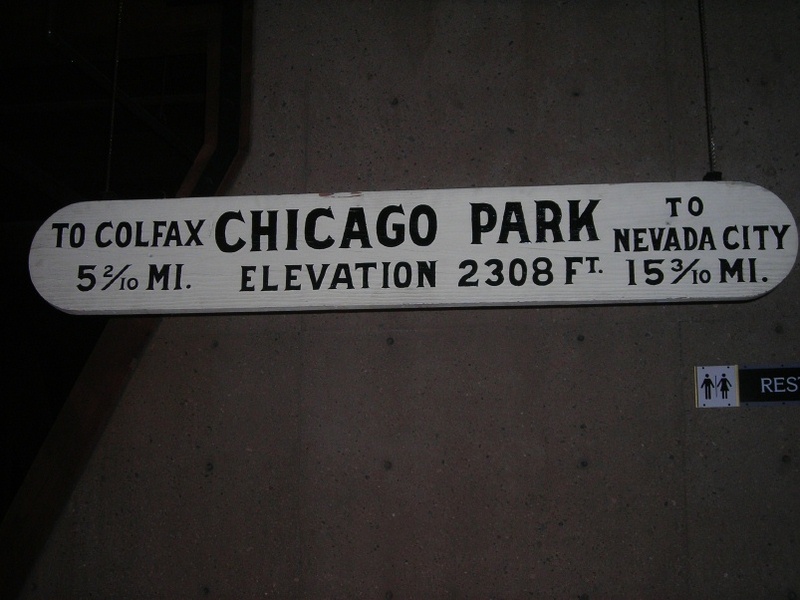 A sign from Chicago Park Station on the Nevada County Narrow Gauge. July, 2009. Western Pacific F7A 913. July, 2009. 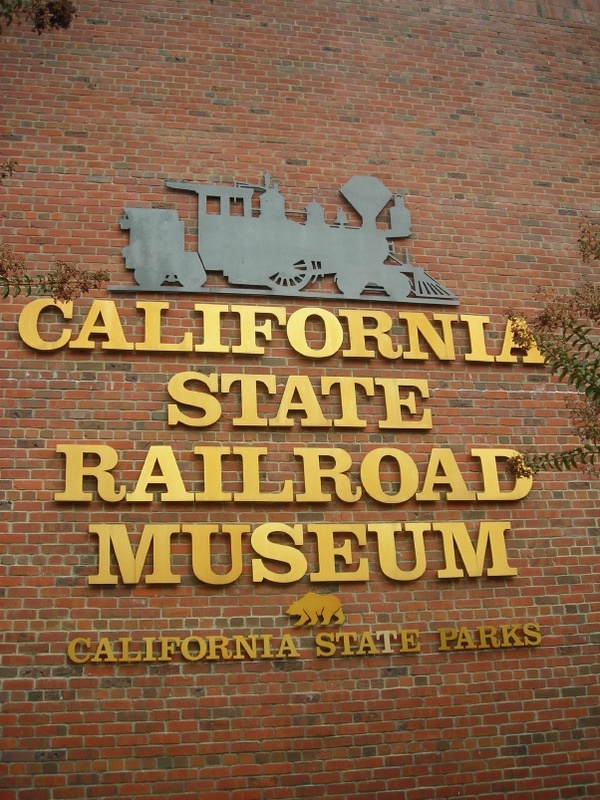 The California State Railroad Museum. April, 2010. We took a drive up to Sacramento. Traffic was bad in several places, including the Yolo Causeway. 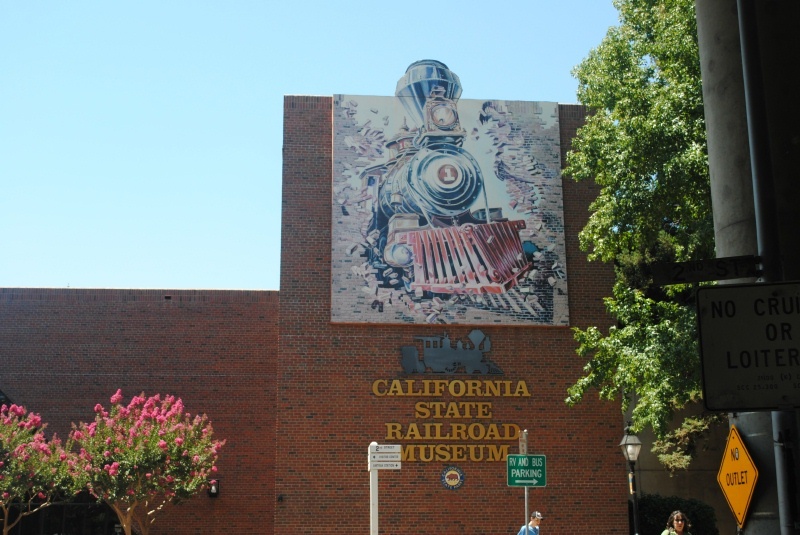 We visited the California State Railroad Museum. Downstairs there was a nice exhibit of toy trains. There was also an exhibit called "The Migrant Project: Contemporary California Farm Workers." It was moving. 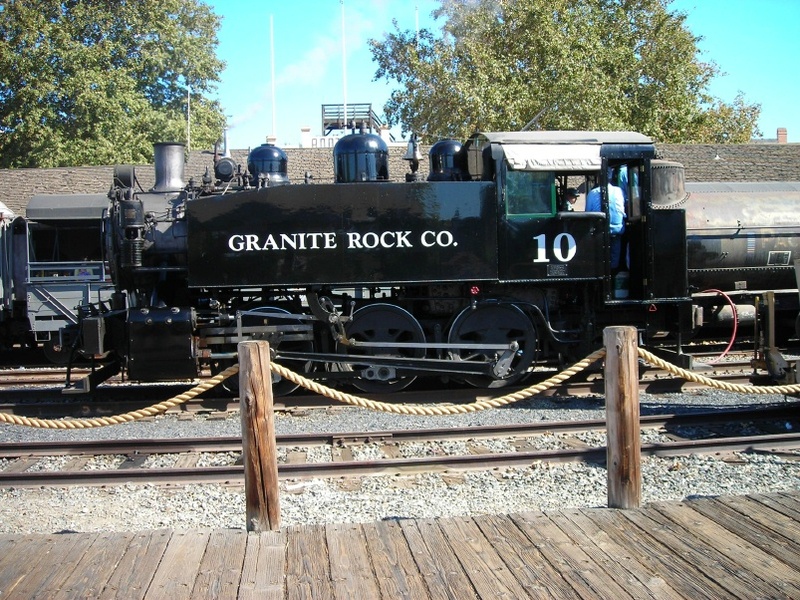 Granite Rock 10, which pulls the Sacramento Southern excursion train, takes water by the turntable. April, 2010. 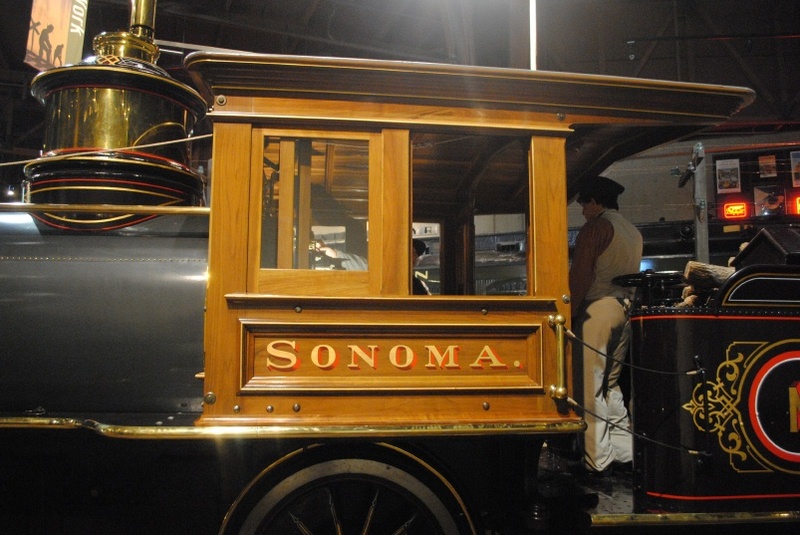 North Pacific Coast 12, built by Baldwin in 1875, ran from Sausalito to the Russian River. April, 2010. 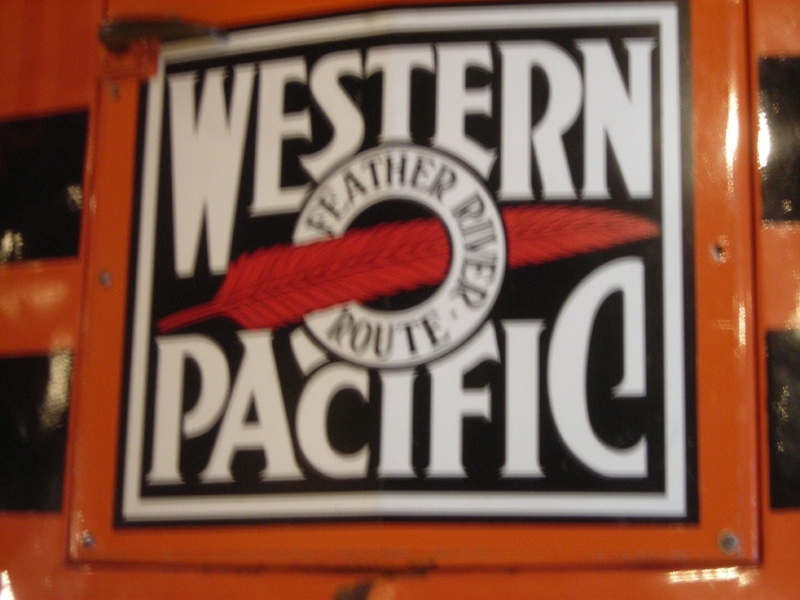 Western Pacific's Feather River Route herald from the nose of F7 913. April, 2010. Southern Pacific's classic herald from narrow gauge boxcar 331. April, 2010. 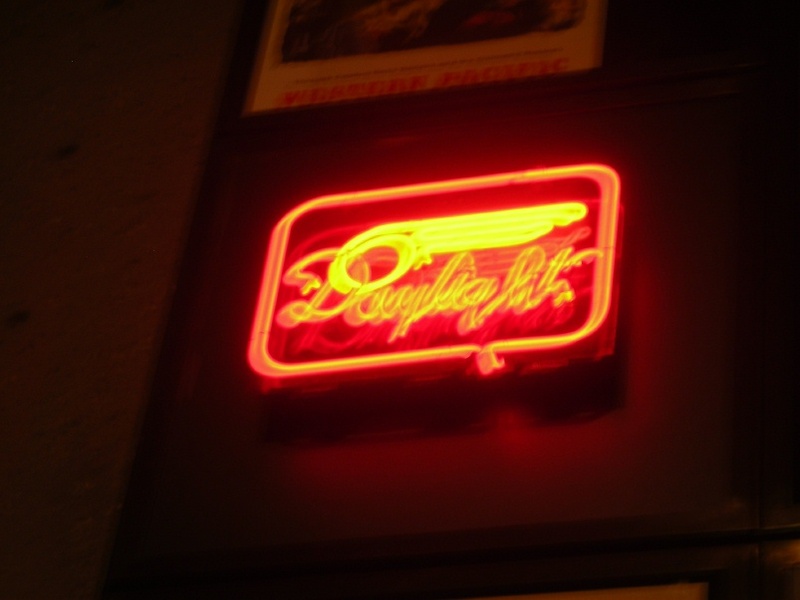 A neon drumhead from Southern Pacific's premiere Coast Daylight between San Francisco and Los Angeles. April, 2010. 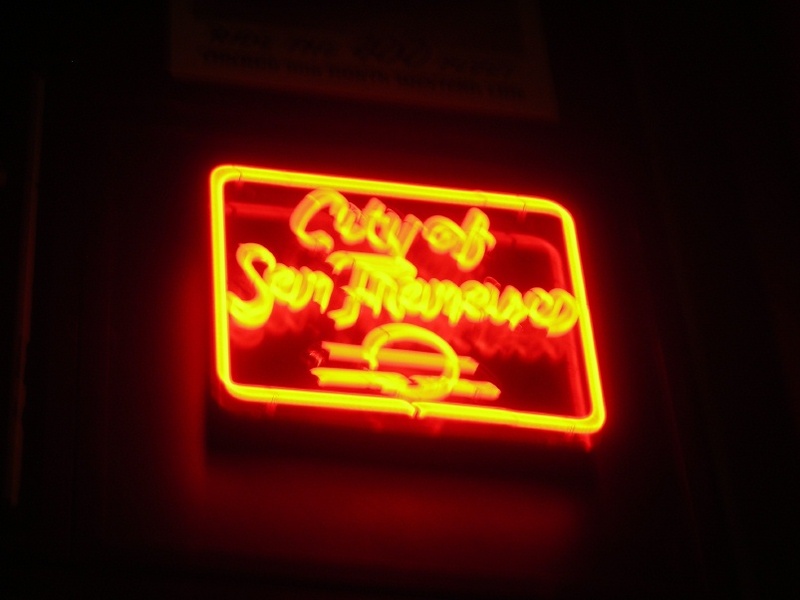 A neon drumhead from the Milwaukee Road/Union Pacific/Southern Pacific streamliner City of San Francisco between Chicago and San Francisco. April, 2010. 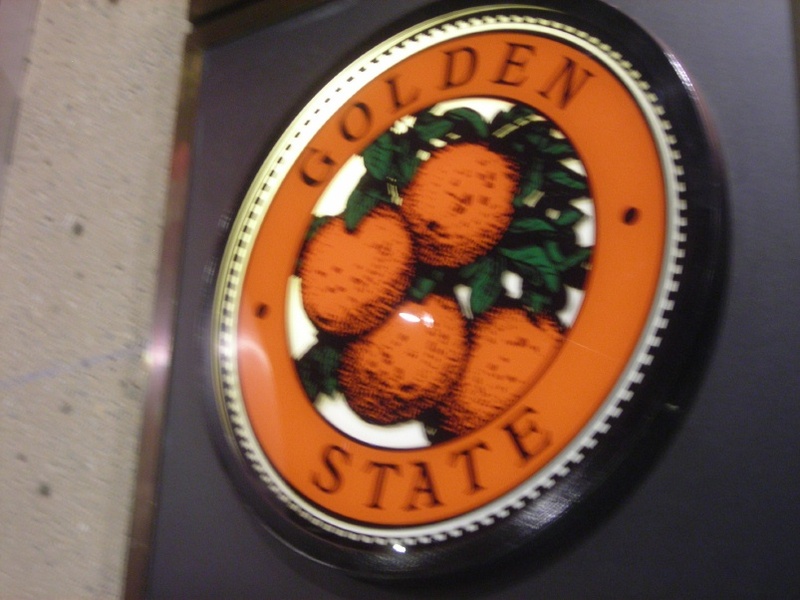 A drumhead for the Golden State Limited, operated by Rock Island and Southern Pacific between Chicago and Los Angeles. April, 2010. 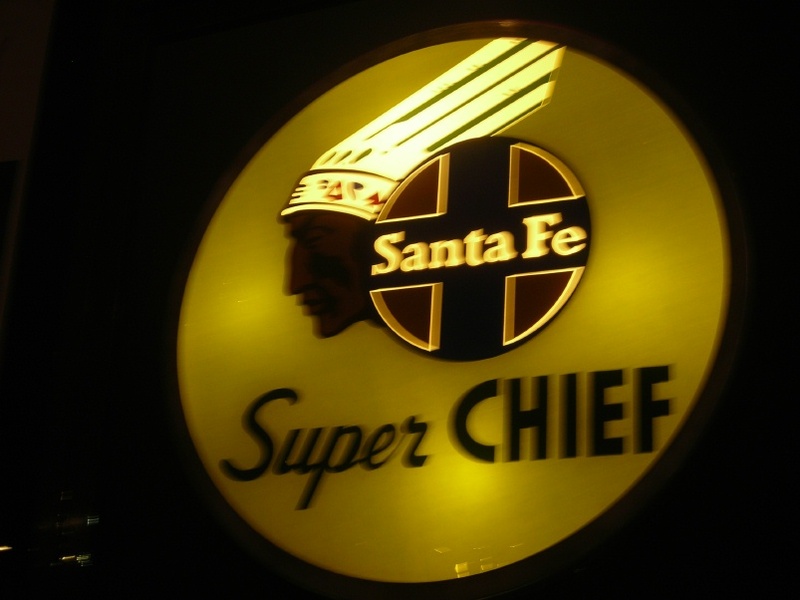 A Santa Fe Super Chief drumhead. April, 2010. 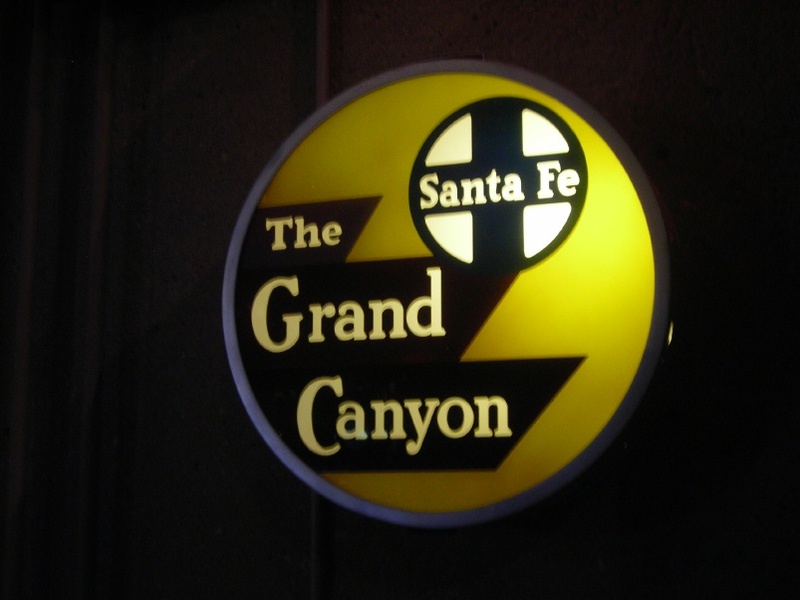 A Santa Fe Grand Canyon Limited drumhead. April, 2010. 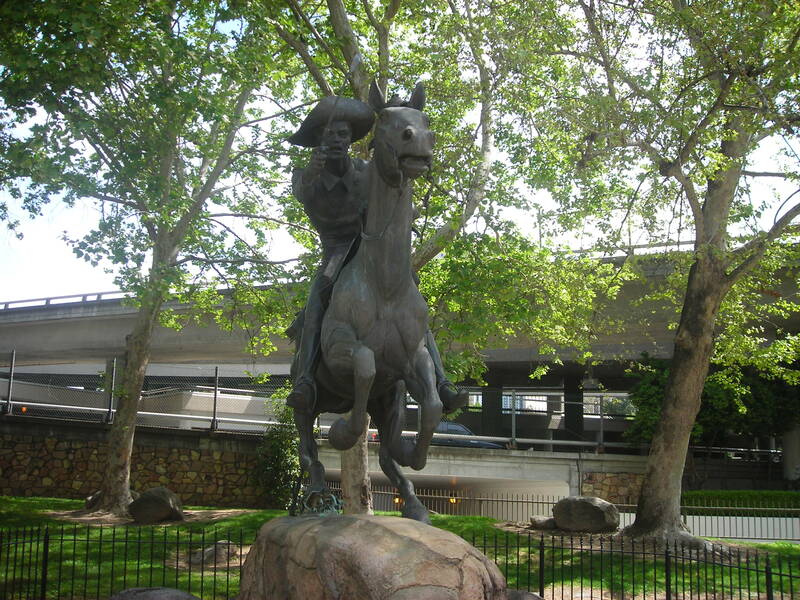 Thomas Holland created this statue to commemorate the Pony Express. Mail arriving from Saint Joseph, Missouri, was handed onto steamboats to San Francisco. It stands at Second and J Streets. April, 2010. 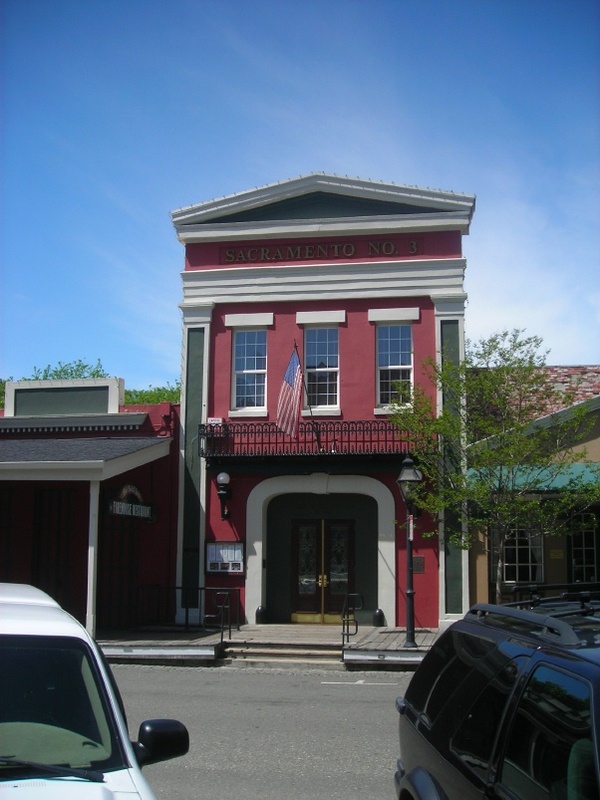 Sacramento Number 3 was built in 1853. It was used as a firehouse until 1921. It is now a nice restaurant. April, 2010. 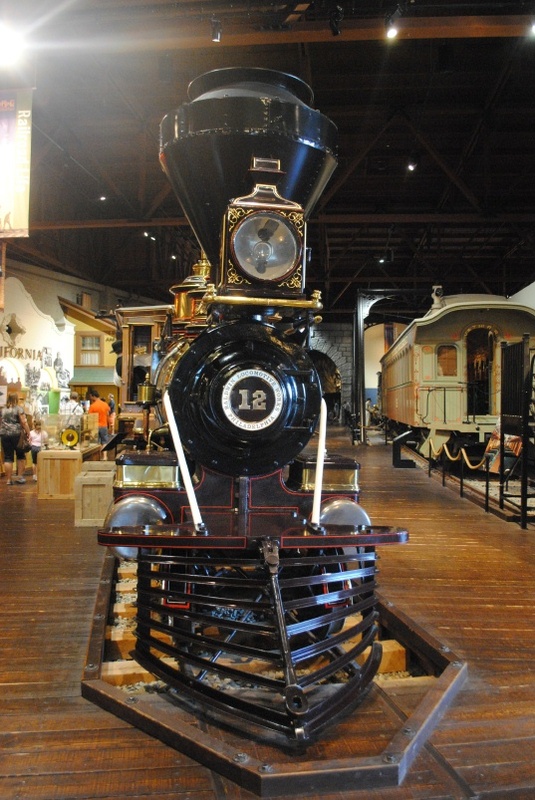 The California State Railroad Museum. July, 2012. 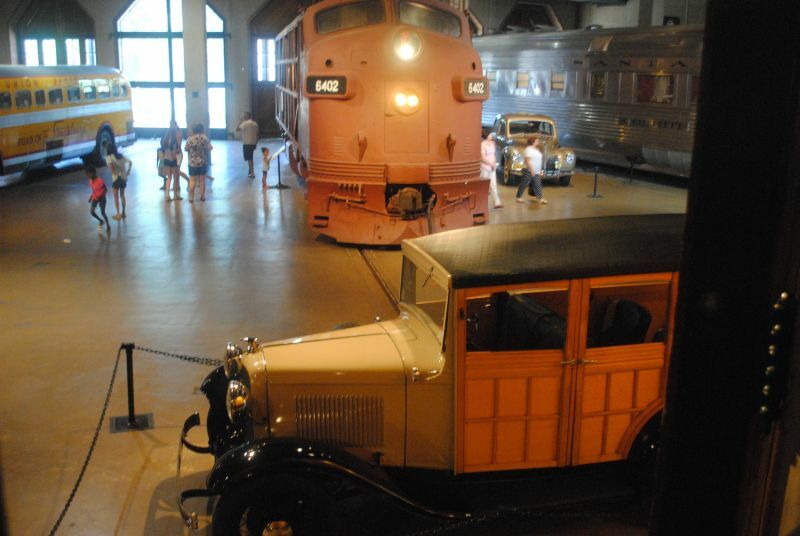 In July, 2012 we took a drive up to Sacramento to visit the California State Railroad Museum. 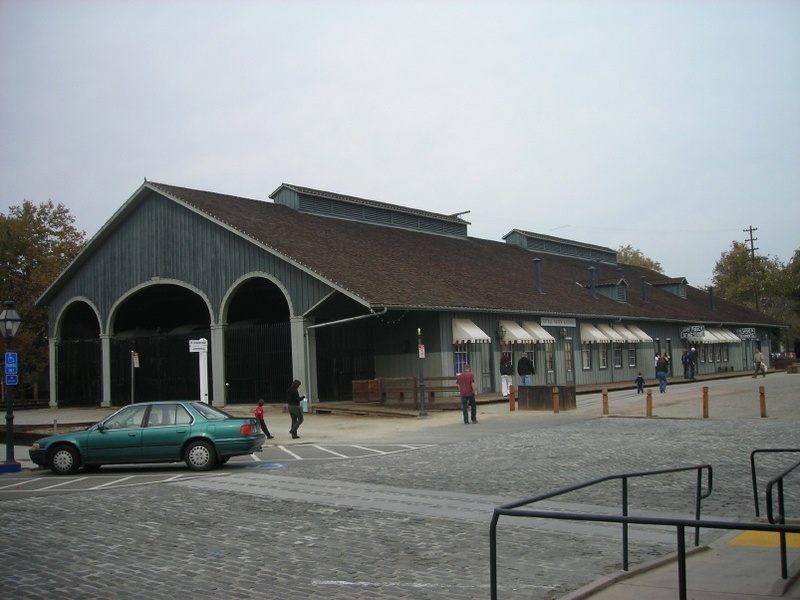 The 1926 Southern Pacific Depot is used by Amtrak and Caltrain. July, 2012. 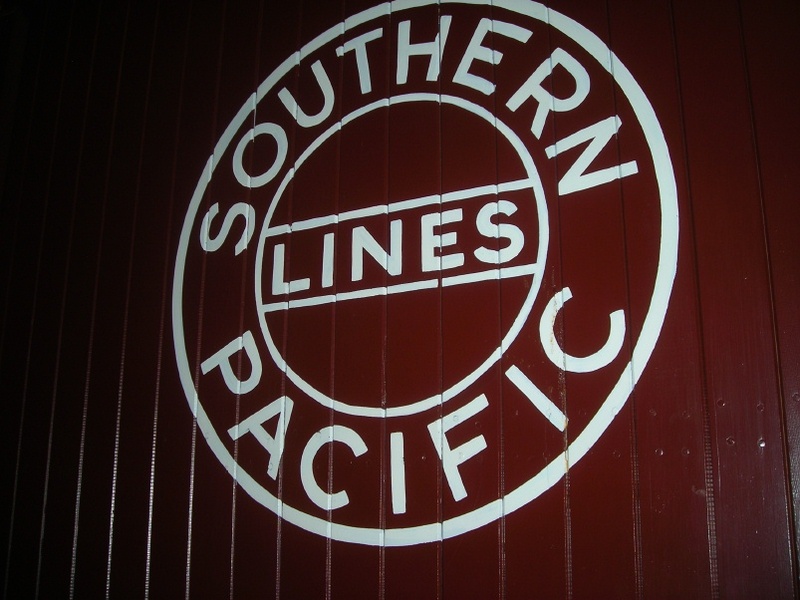 "Southern Pacific Lines" is still visible over the main entrance. July, 2012. 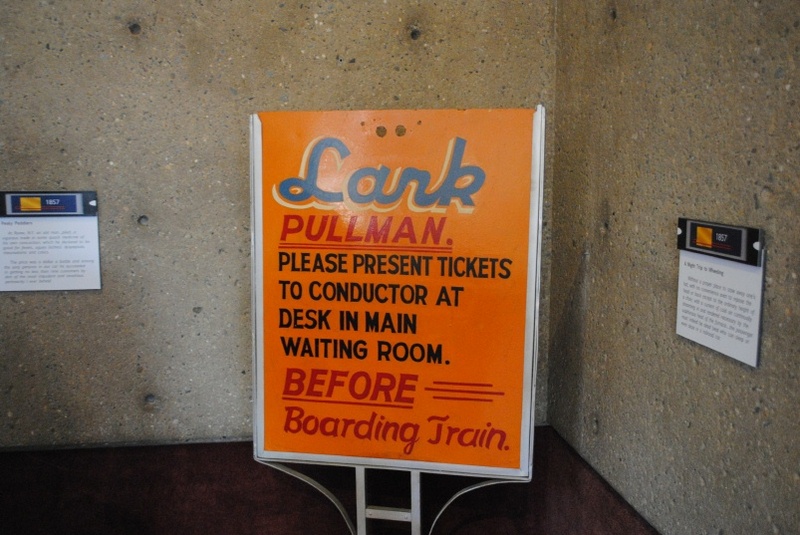 Southern Pacific's Lark was an all-Pullman overnight train between Los Angeles and San Francisco. July, 2012. 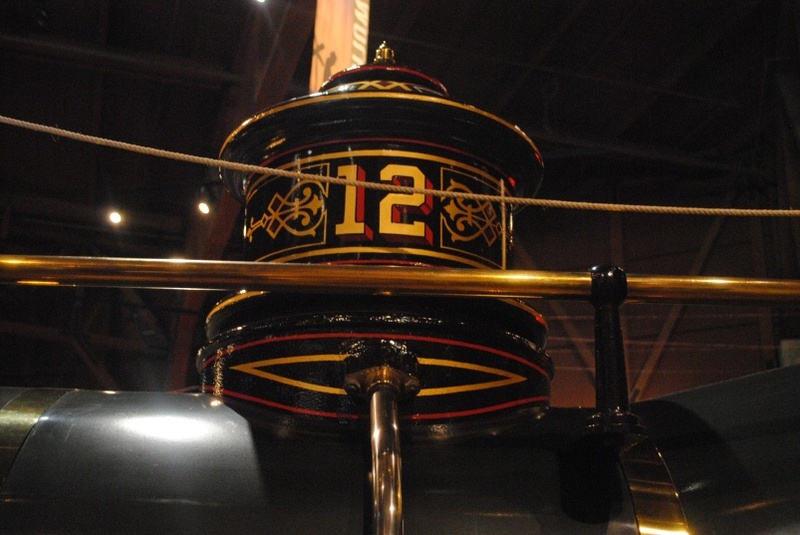 North Pacific Coast 12, built by Baldwin in 1876, ran from Sausalito to the Russian River. July, 2012. 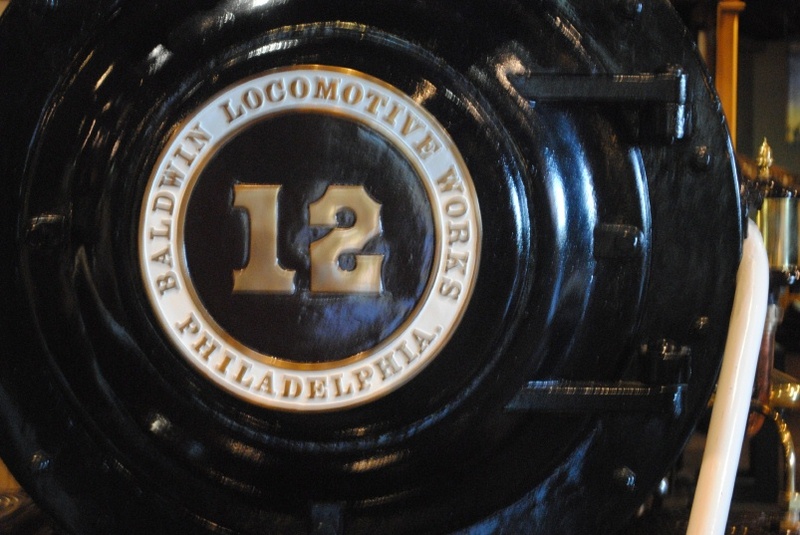 North Pacific Coast 12's Baldwin builder's plate. July, 2012. North Pacific Coast 12's artfully decorated sand dome. July, 2012. North Pacific Coast 12's cab. July, 2012. North Pacific Coast 12's tender. I like the 3-D effect of the lettering. July, 2012. 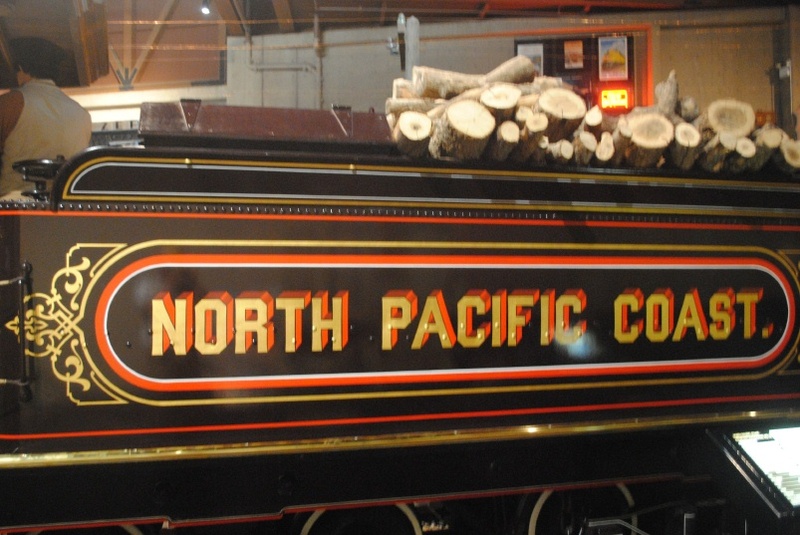 North Pacific Coast 12's number plate. July, 2012. 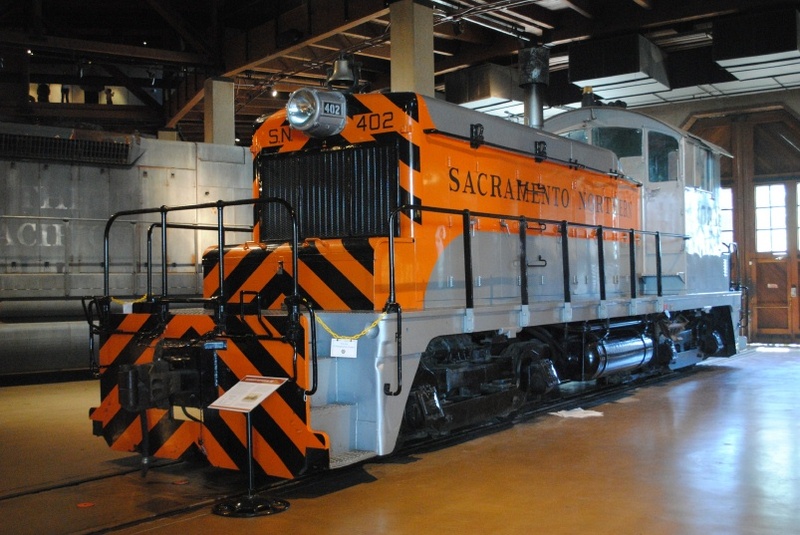 Sacramento Northern EMD SW-1 402 was built in 1939. July, 2012. 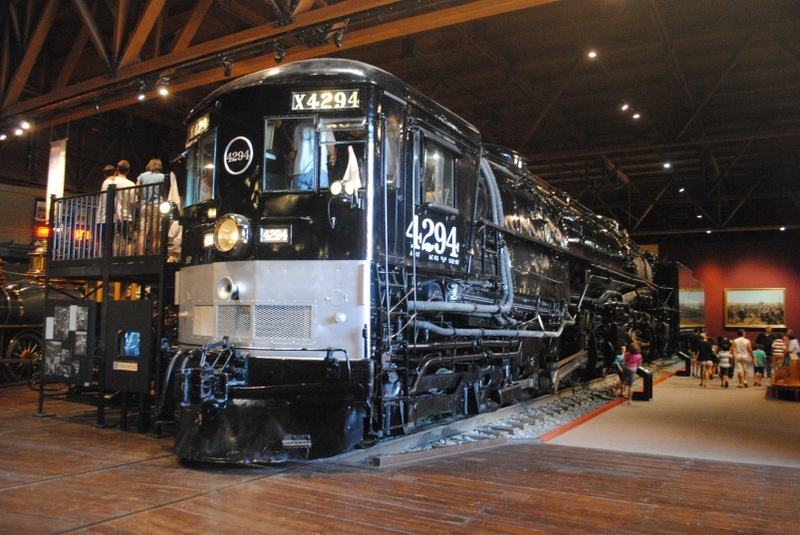 Southern Pacific's Baldwin cab-forward 4294 was built in 1944. July, 2012. Another angle of Southern Pacific's Baldwin cab-forward 4294. July, 2012. 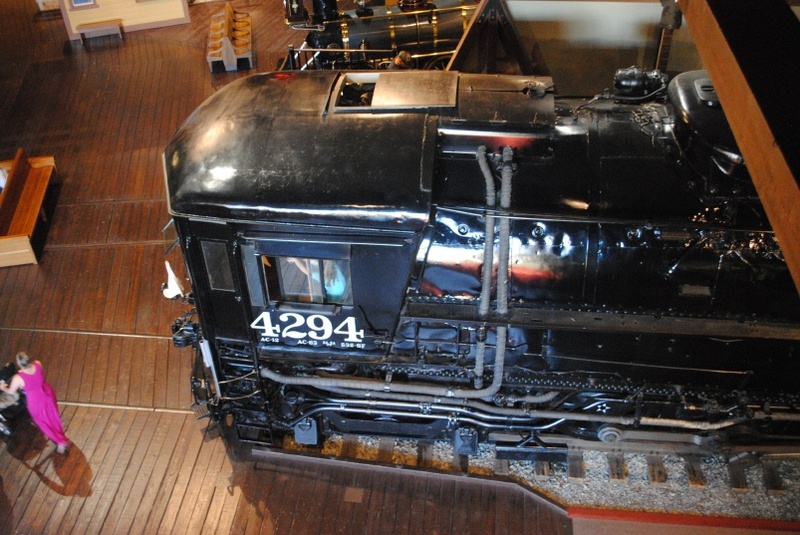 Southern Pacific's Baldwin cab-forward 4294 seen from the upper gallery. July, 2012. 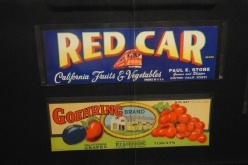 The Pacific Fruit Express refrigerator car had a display of fruit crate labels. This Dominator Brand tomato crate label features an attacking fighter plane. From the general shape and the fire flaring from the propellor hub, I guess it is supposed to be a Bell P-39 Airacobra. July, 2012. 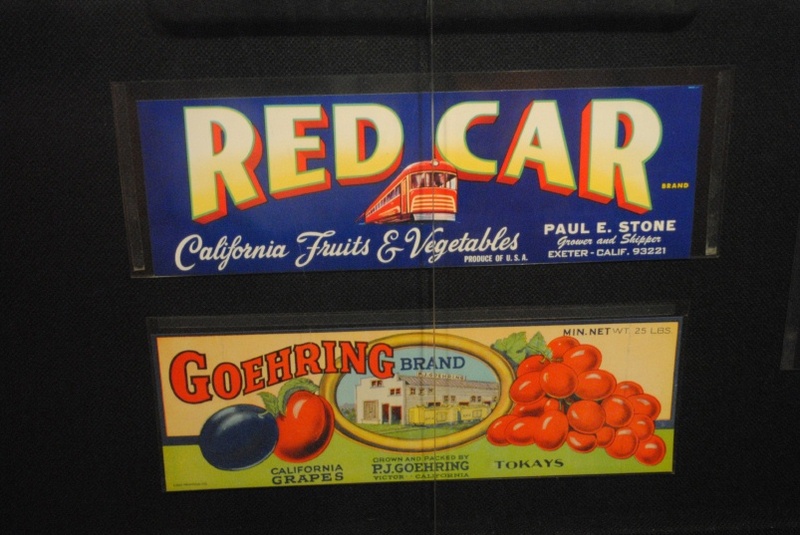 The Pacific Fruit Express refrigerator car had a display of fruit crate labels. I figure the Red Car label is supposed to refer to the Pacific Electric, but the car looks more like some streamlined car from the East or the Midwest. July, 2012. 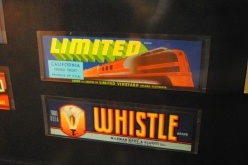 The Pacific Fruit Express refrigerator car had a display of fruit crate labels. The Limited label, from Limited Vineyard, features a streamlined locomotive, perhaps an EMD F unit. July, 2012. 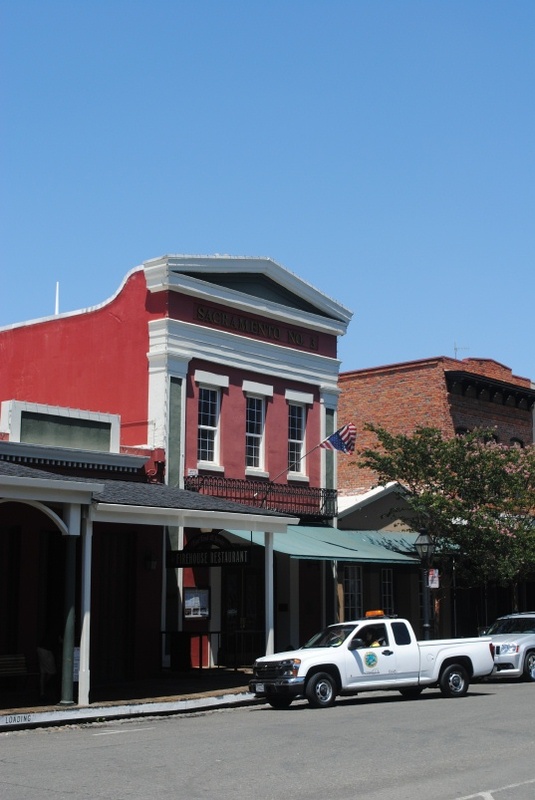 Sacramento Number 3 was built in 1853. It was used as a firehouse until 1921. It is now a nice restaurant. July, 2012. 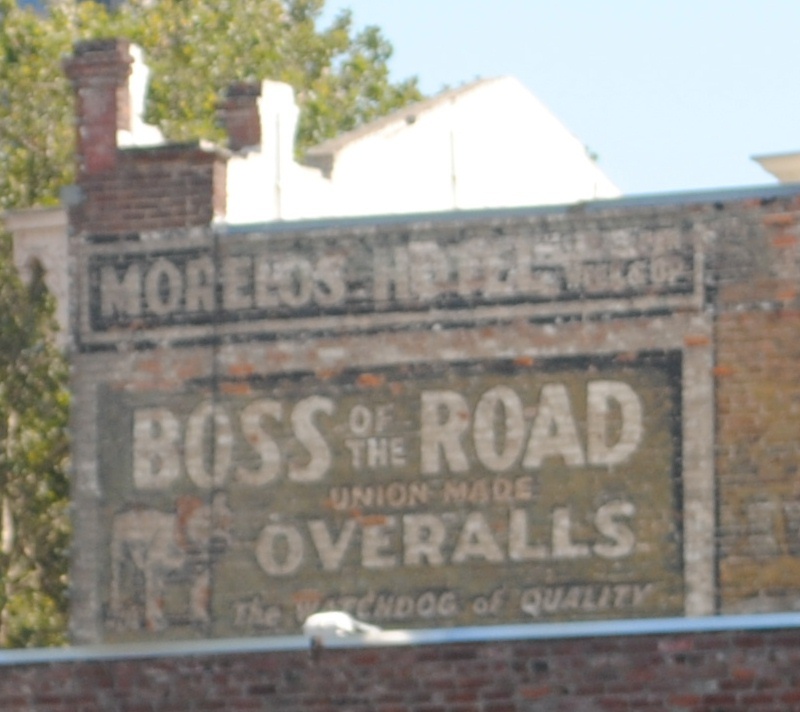 Ghost signs for Morelo's Hotel and Boss of the Road Overalls, "The Watchdog of Quality," across I Street from the museum. July, 2012. 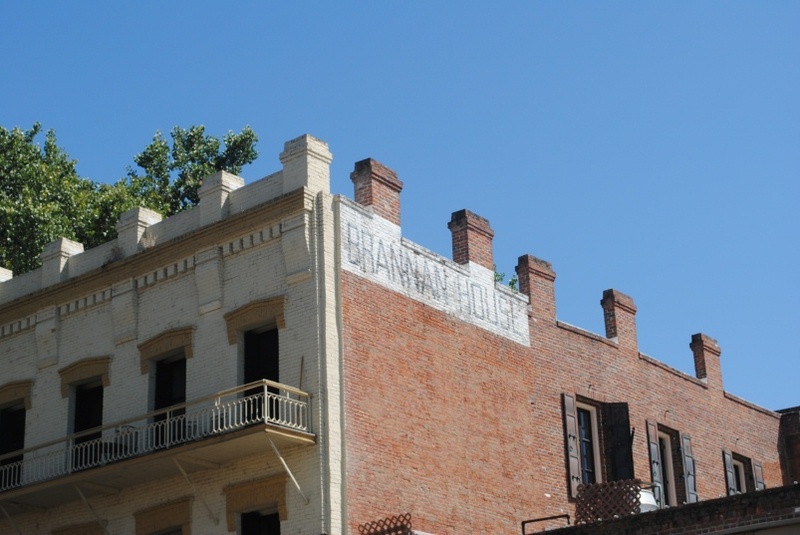 A ghost sign on the Brannan House. July, 2012. A restored ghost sign for Booth & Co Wholesale Grocers. July, 2012. Building America exhibit sign at the California State Railroad Museum. July, 2013. Because we had to cut short our Disneyland trip, we decided to spend two nights in Sacramento. Traffic was good on the drive up. 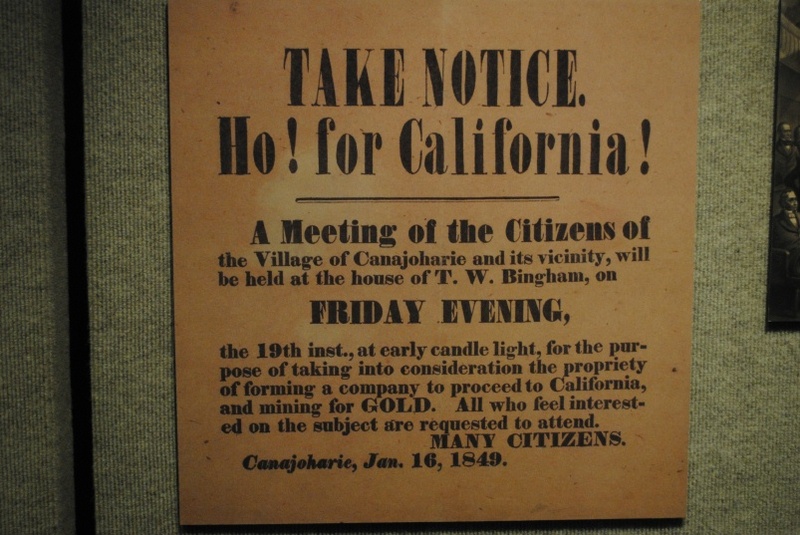 A notice in the Building America exhibit encourages people from the New York state town of Canajoharie (I had to look it up) to attend a meeting about migration to California. July, 2013. 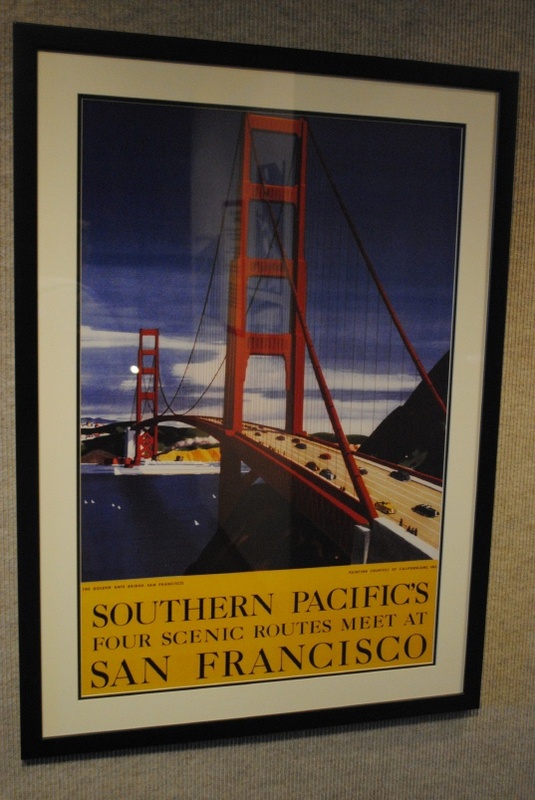 A Southern Pacific ad in the Building America exhibit shows the newly built Golden Gate Bridge and explains that "Southern Pacific's Four Scenic Routes Meet at San Francisco". July, 2013. 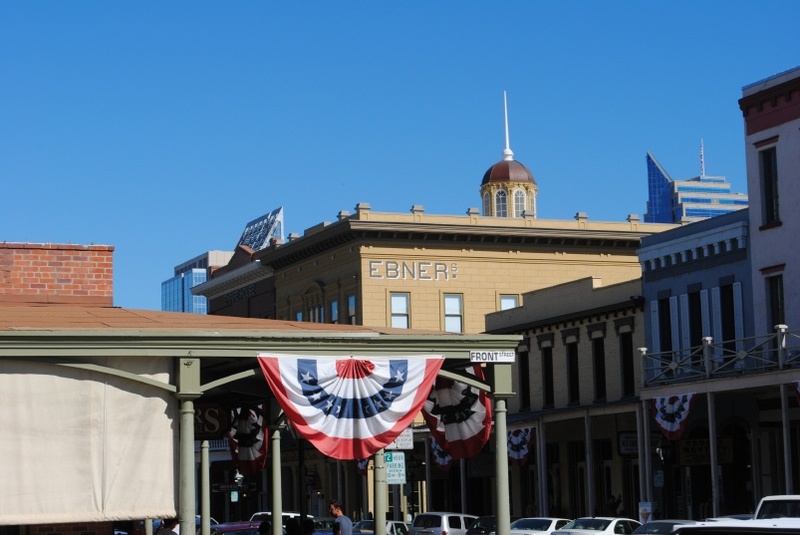 We walked through Old Sacramento and had lunch at Johnny Rockets in the K Street Mall. Then we went to the state railroad museum. 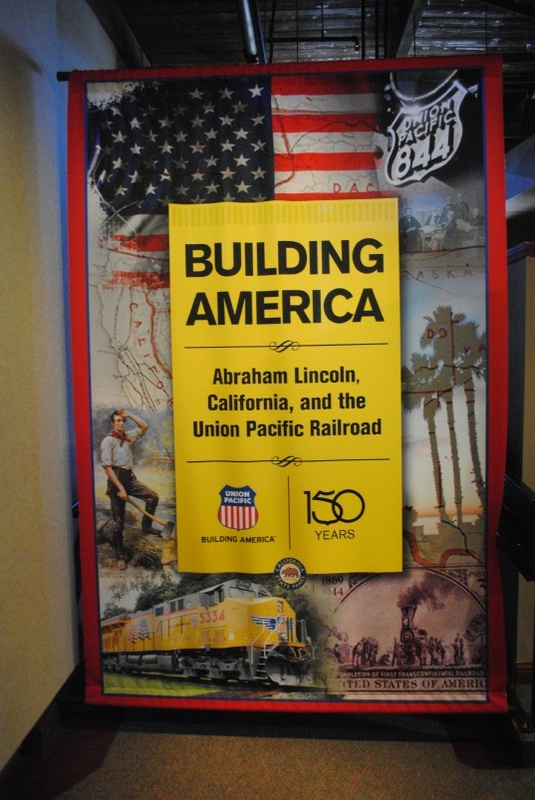 The upstairs gallery had "Building America: Abraham Lincoln, California, and the Union Pacific Railroad," a touring exhibit in honor of UP's 150th anniversary. It included documents, artifacts, histories of some of UP's acquisitions, and many advertising posters. We watched an Amtrack locomotive get pulled out the roundhouse doors. The Amtrak locomotive on the turntable. July, 2013. 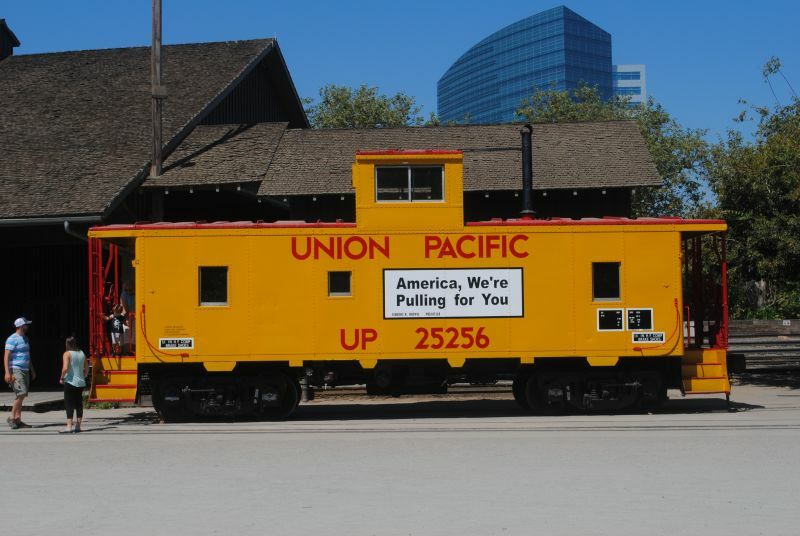 Union Pacific caboose 25256. July, 2013. A restored ghost sign on the What Cheer House. 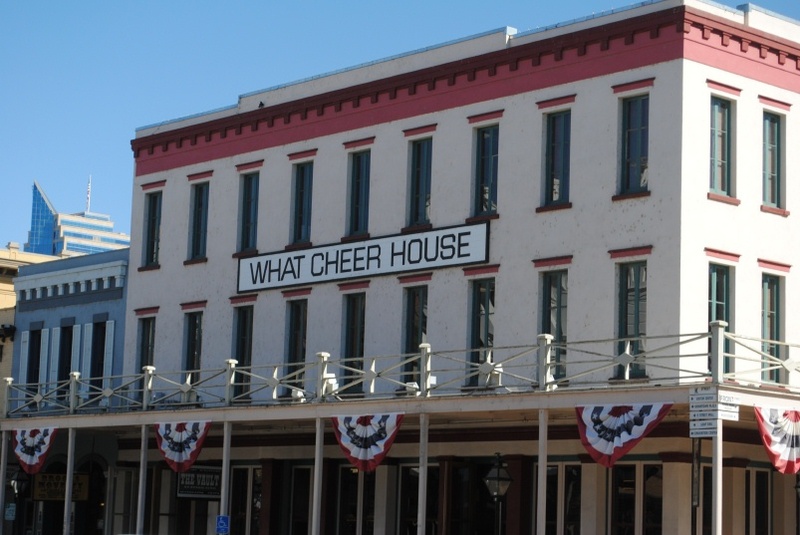 What Cheer House was a generic name in 19th Century California for hotels that did not serve alcohol. There was a What Cheer House at Sacramento and Leidsdorff Streets in San Francisco. July, 2013. 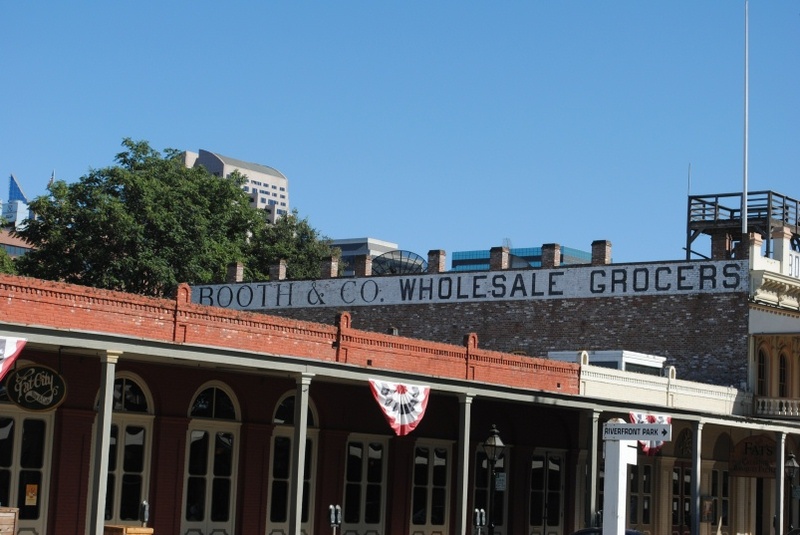 A restored ghost sign for Booth & Co Wholesale Grocers. July, 2013. A restored ghost sign for Ebner & Co. July, 2013. The next day we had planned to go to the state fair, but it was too hot. 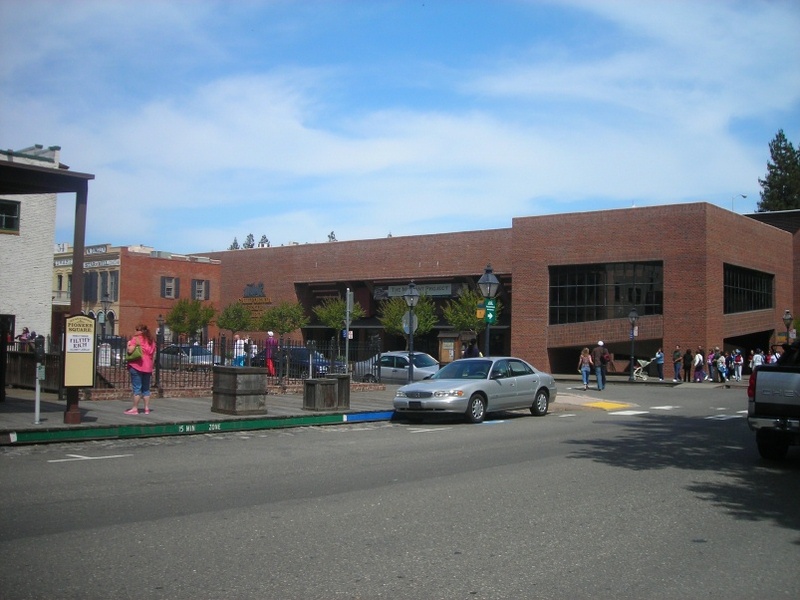 We drove to Folsom and visited the outlets, then back to Sacramento and went to the California Museum. My wife thinks it would be a great place to take a field trip. We had not visited since the Lincoln Bicentennial. There was a small exhibit on the missions and one on Charles and Ray Eames. Many visitors headed straight for the Eames. My wife didn't remember them till she saw the chairs. The exhibit on Japanese-American relocation made me tear up. 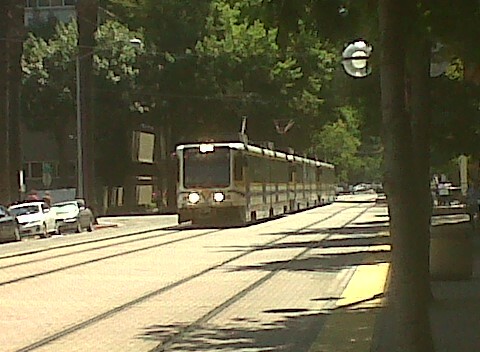 A Sacramento Regional Transit District light rail train passes the California Museum. I believe it is a Siemens Duewag U2A. I like the high-mounted central headlight. July, 2013. 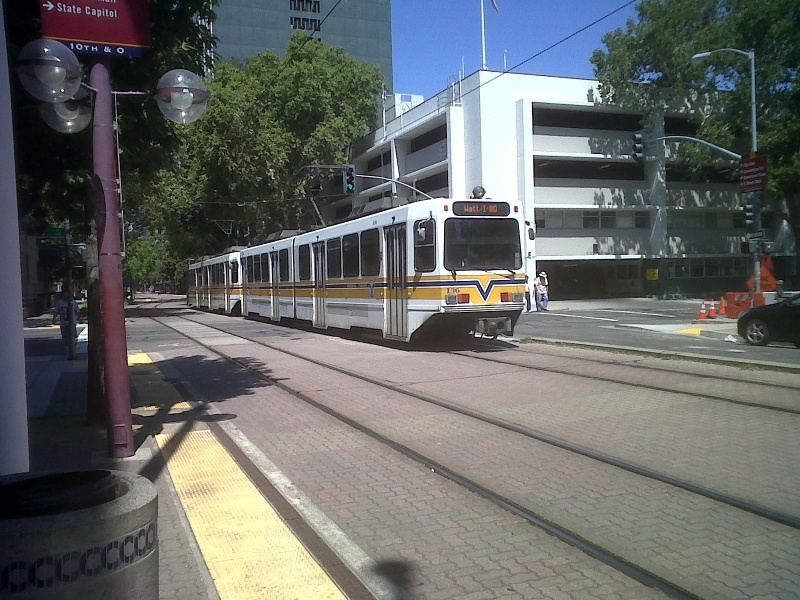 My wife's phone rang as we were about to enter the Museum, so I took some photos of Sacramento Regional Transit District light rail trains as they passed along transit-only O Street. The same train continues after passing the Museum. July, 2013. 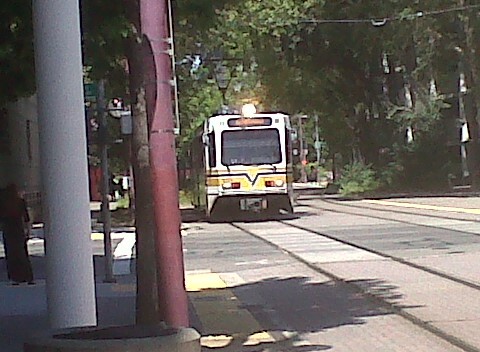 A train approaches from the other direction, crossing Tenth Street. July, 2013. Another train approaches the Museum on O Street. July, 2013. Then we visited the K Street Mall. The next day we drove home, with a stop at the Nut Tree. Traffic was clear till we got to the Berkley city limits. 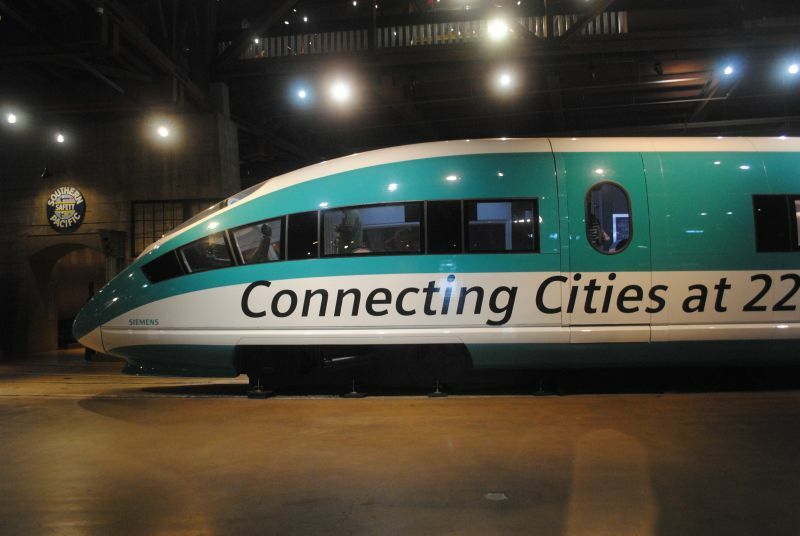 Part of a High Speed Rail mockup by Siemens. July, 2016. Traffic was good on the drive up to Sacramento. 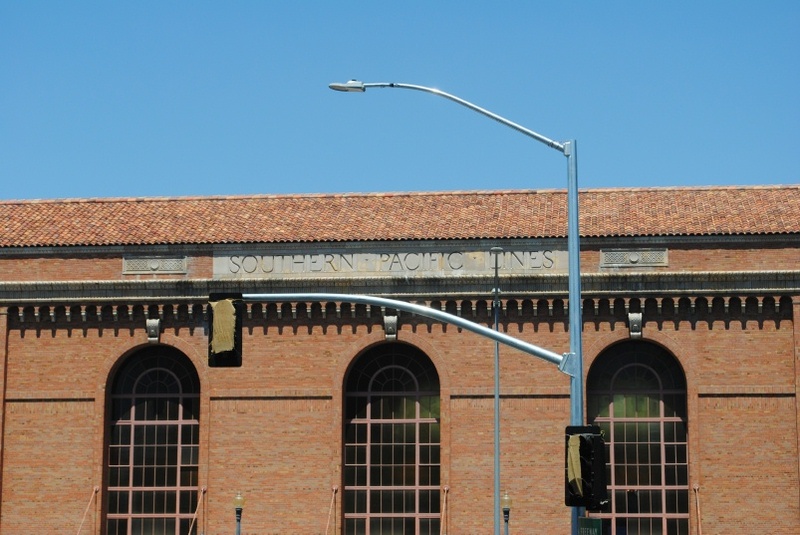 At the Sacramento Southern ticket office, we picked up tickets for a first class train ride. Then we went to the museum. 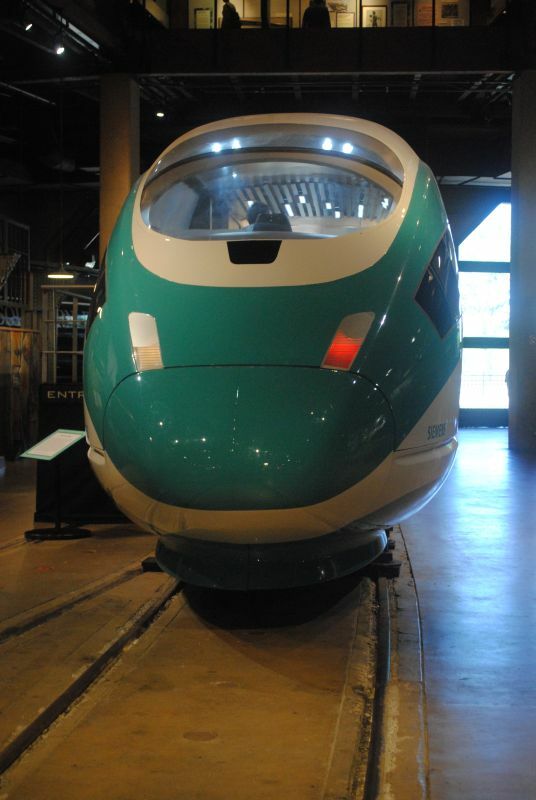 The nose of a High Speed Rail mockup by Siemens. July, 2016. 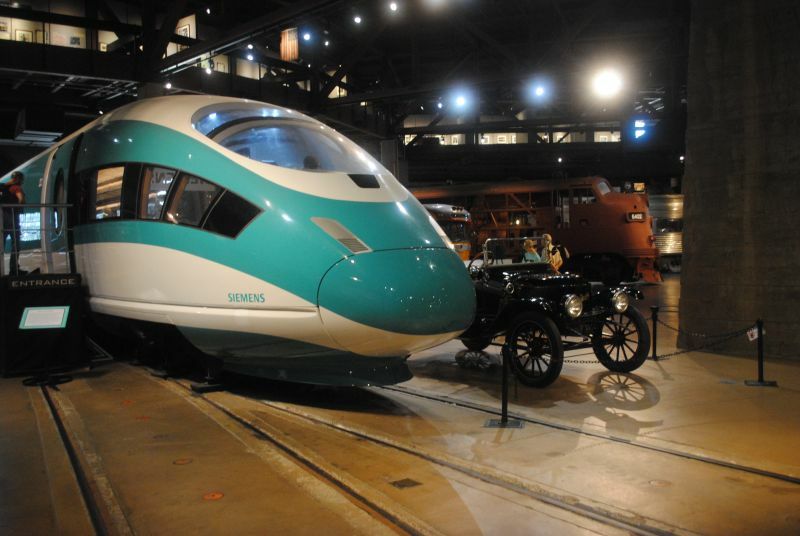 One of the features was a mockup of a High Speed Rail trainset. 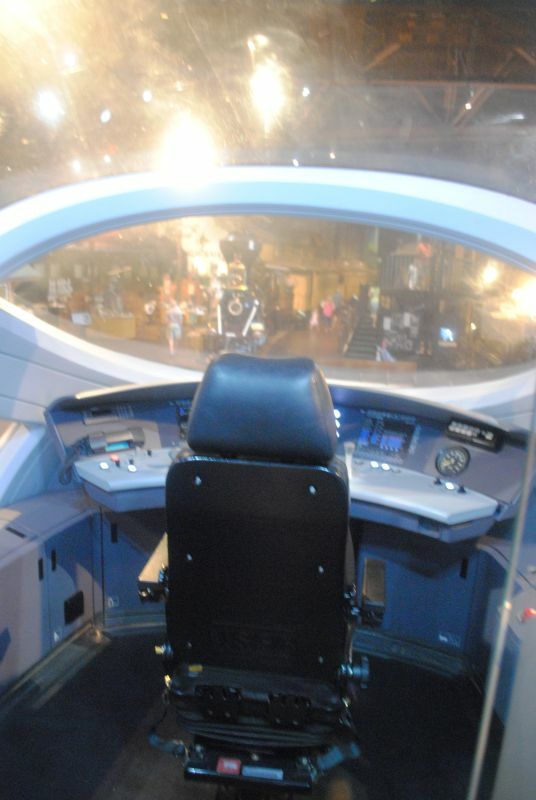 A view from the engineer's seat on the High Speed Rail mockup. July, 2016. The museum had an interesting exhibition on the effect of the 1894 Pullman Strike on Sacramento. 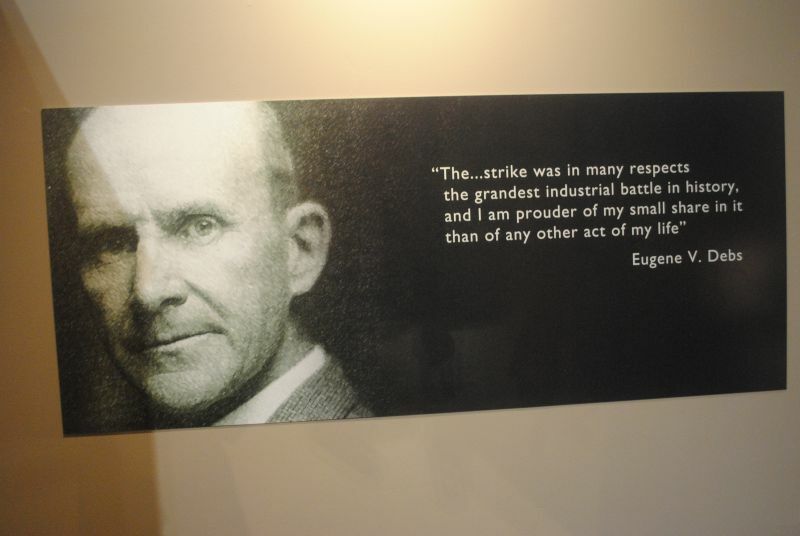 After initially resisting it, Eugene V Debs became one of the leaders. July, 2016. Granite Rock 10 pulls into the station. It had recently returned after extensive servicing. July, 2016. 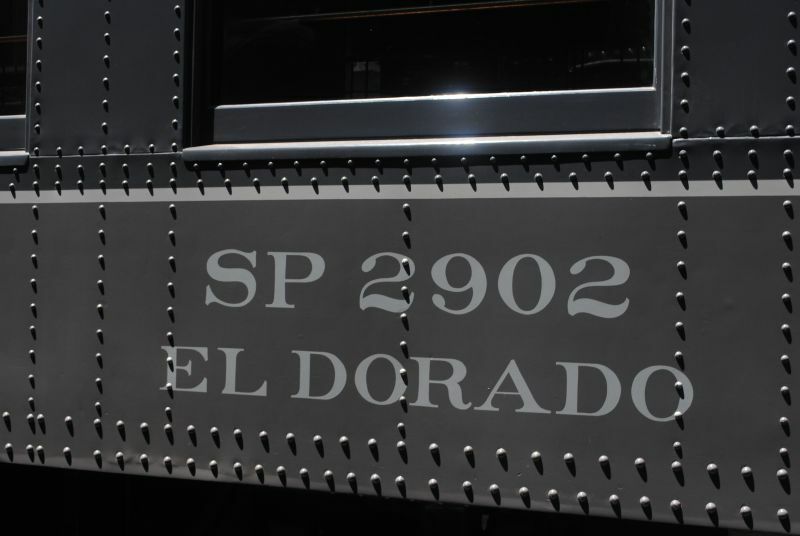 After visiting the museum, we had a little lunch and then rode in observation car El Dorado on the Sacramento Southern. It was a nice ride. The stewards served cookies, pretzels or peanuts, and soft drinks. Observation car El Dorado. July, 2016. 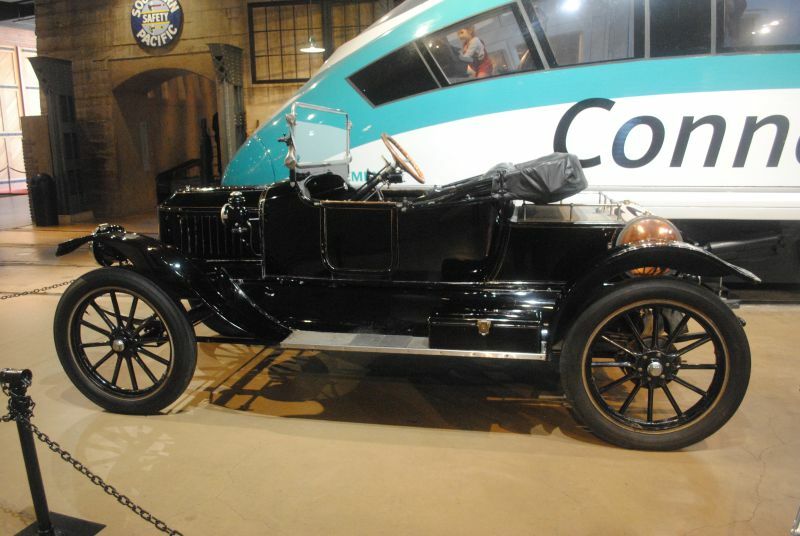 The nose of a High Speed Rail mockup with a 1914 Stanley Steamer from the collection of the California Automobile Museum. August, 2017. Traffic was light going up. The weather in Sacramento was pleasant, not too hot. 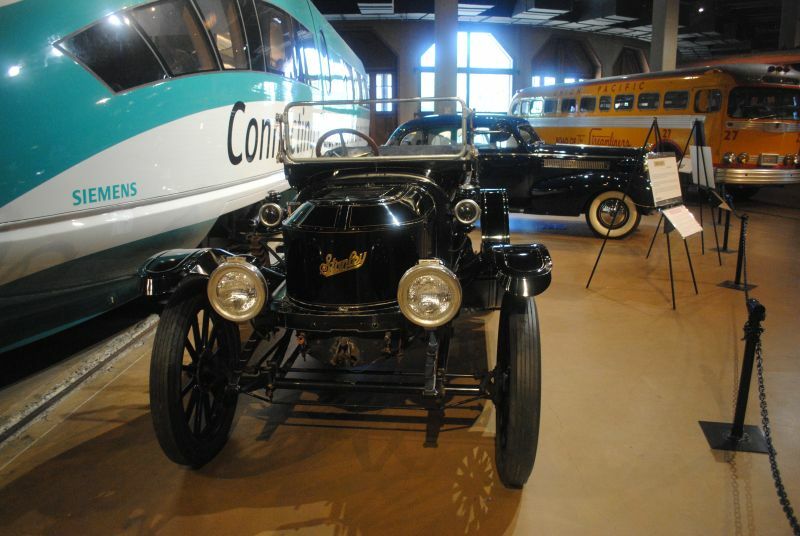 The California State Railroad Museum had an exhibit of autos from the California Automobile Museum, which used to be the Towe Ford Museum. I wanted to visit that place, but it is closed on Tuesdays. In the lobby there was an exhibit of images showing Southern Pacific employee sports teams, including baseball, softball, basketball, volleyball and bowling. I didn't get any photos. A nicely painted Union Pacific caboose, 25256, was out by the arcade depot. August, 2017. A rear view of Southern Pacific cab forward 4294. 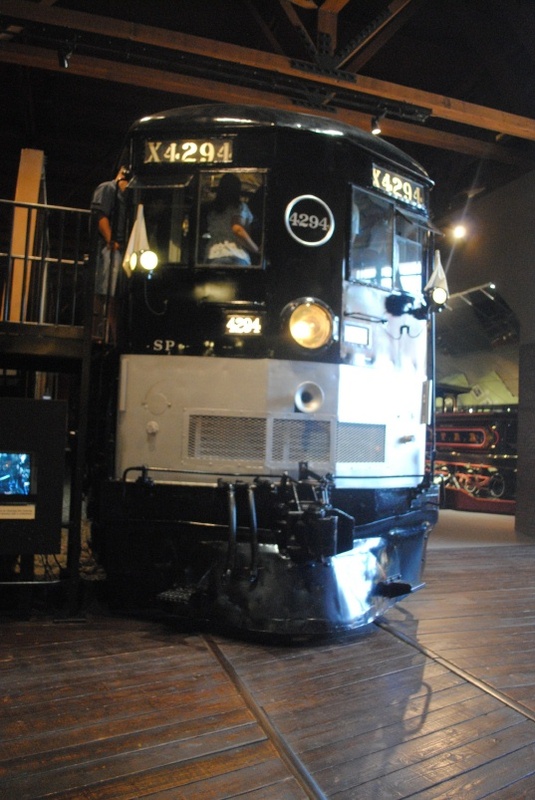 I wish SP would have preserved a cab forward locomotive outside of the museum so we could see it run again. August, 2017. Central Pacific Number 1, the Governor Stanford, was built by Richard Norris in 1862. Shipped around Cape Horn in crates, it arrived in Sacramento in 1863. August, 2017. A 1932 Ford Model B woody station hack, seen from the doorway of the wooden reefer. The nose of an EMD F7 locomotive is in the background. 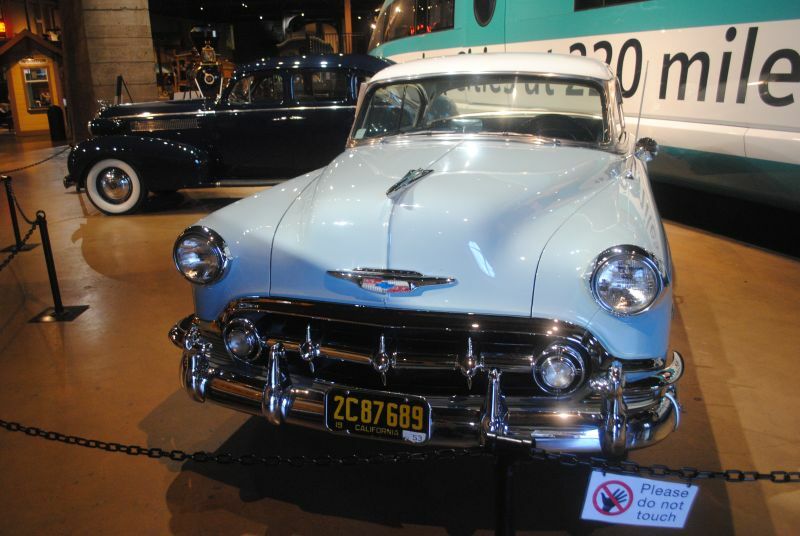 From the collection of the California Automobile Museum. August, 2017. A front view of the 1932 Ford Model B woody station hack. 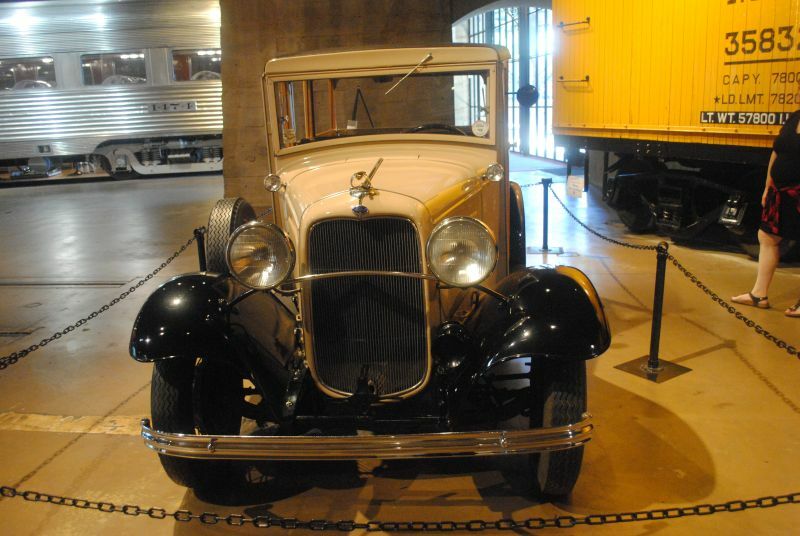 From the collection of the California Automobile Museum. August, 2017. 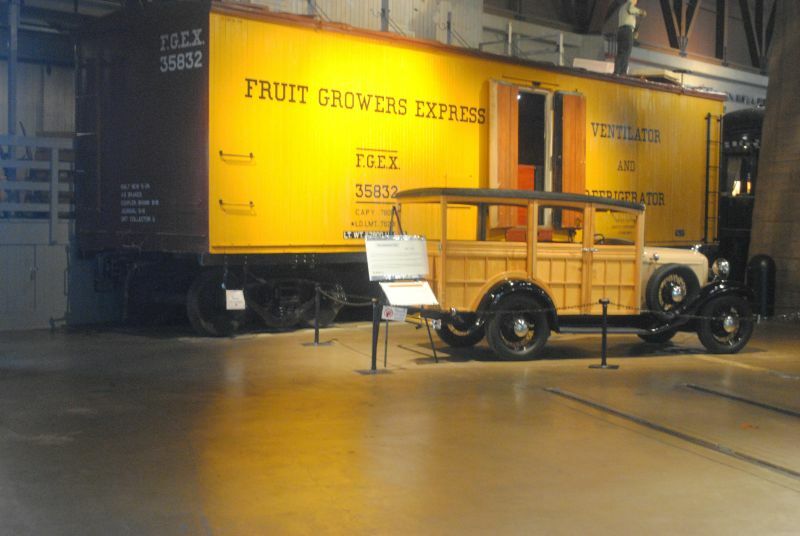 The 1932 Ford Model B woody station hack poses in front of Fruit Growers Express refrigerator car 35832. 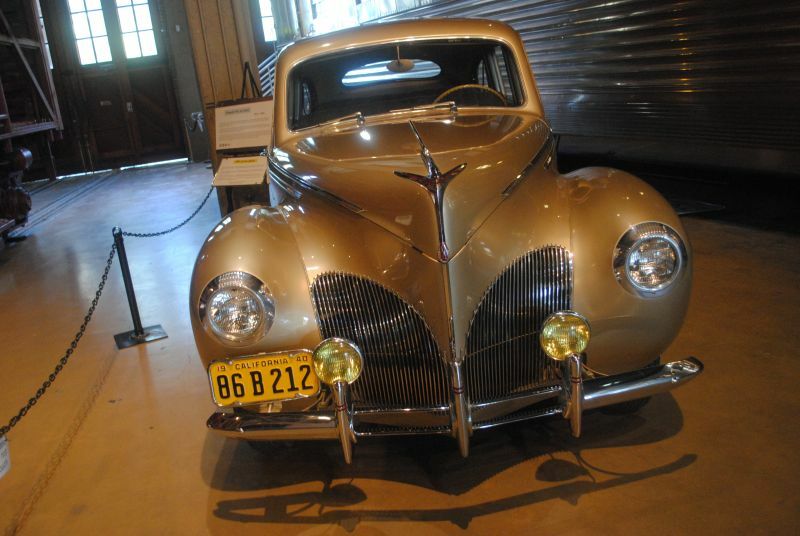 From the collection of the California Automobile Museum. August, 2017. A 1940 Lincoln Zephyr posed between the F7 and Atchison, Topeka & Santa Fe diner 1474, Cochiti. From the collection of the California Automobile Museum. August, 2017. 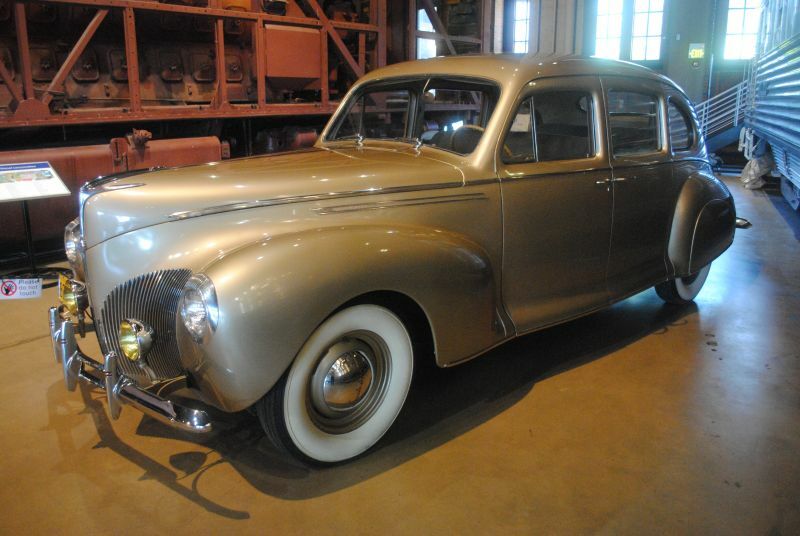 A front view of the 1940 Lincoln Zephyr. From the collection of the California Automobile Museum. August, 2017. A driver's side view of the 1940 Lincoln Zephyr. From the collection of the California Automobile Museum. August, 2017. 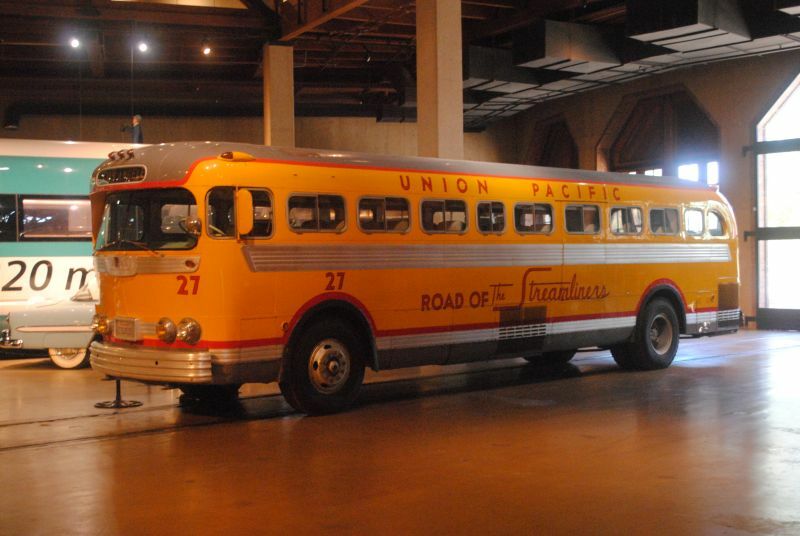 Union Pacific bus 27 was a General Motors PDA-4101. 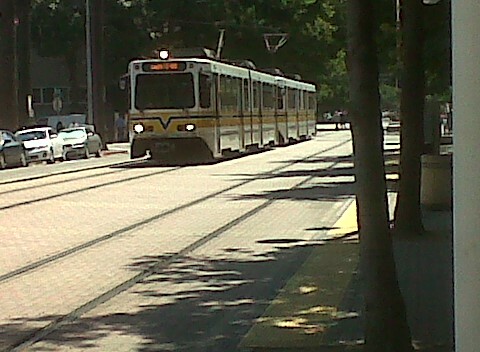 UP used it to connects its East Los Angeles station with suburbs like Long Beach and Anaheim. After Disneyland opened in 1995, the bus made a stop there. Santa Fe operated the bus until 1971. From the collection of the California State Railroad Museum. August, 2017. 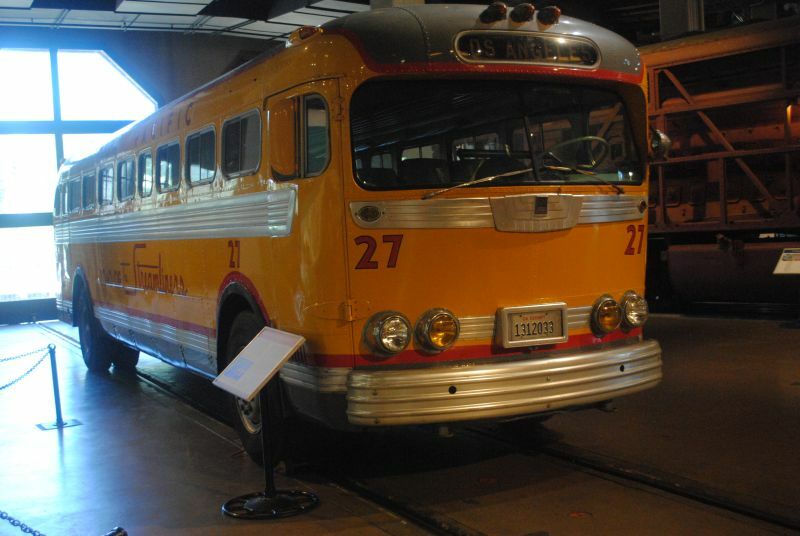 A front view of Union Pacific bus 27. 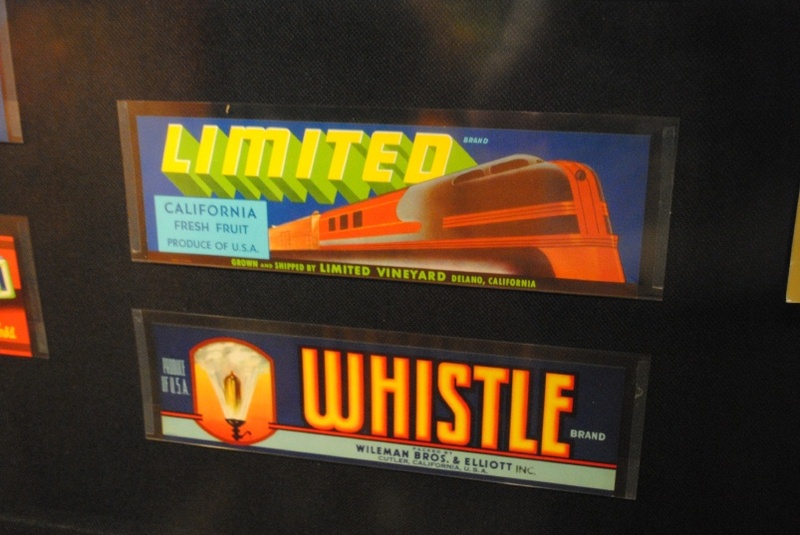 From the collection of the California State Railroad Museum. August, 2017. The 1914 Stanley Steamer. From the collection of the California Automobile Museum. August, 2017. The front of the 1914 Stanley Steamer. The boiler is under the hood. From the collection of the California Automobile Museum. August, 2017. 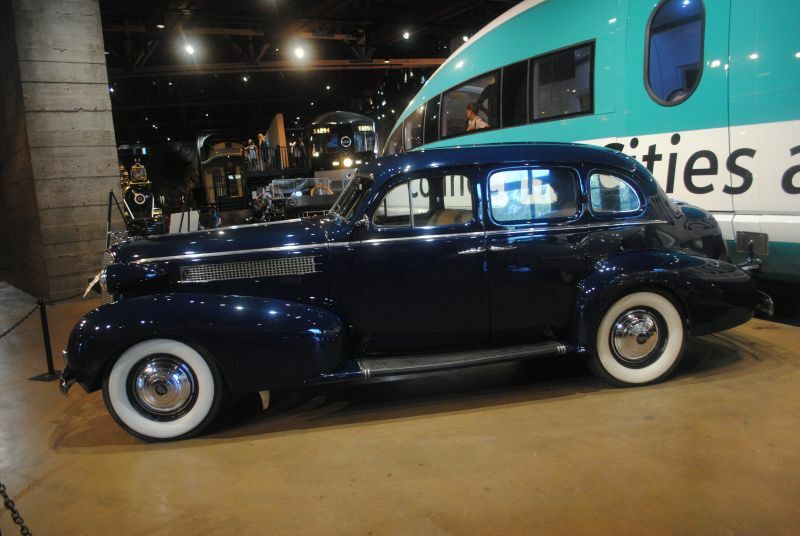 The 1937 Cadillac Series 60 sedan was designed by Harley Earl. From the collection of the California Automobile Museum. August, 2017. 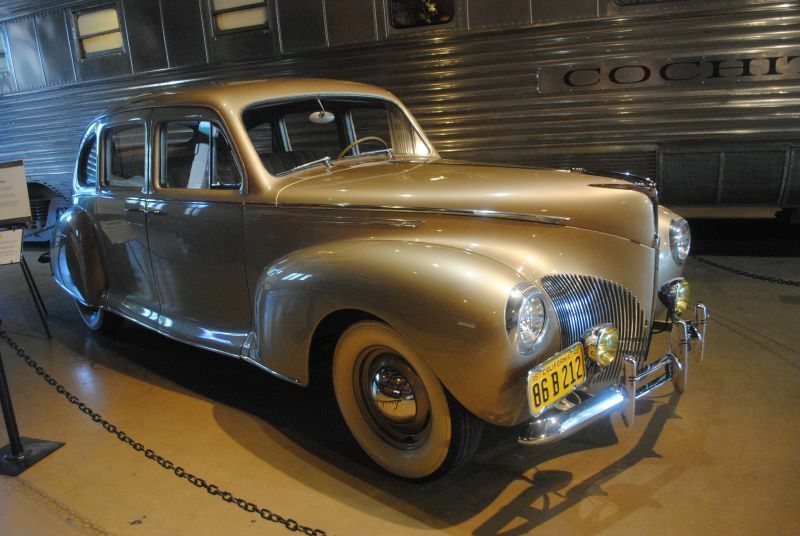 A front view of the 1937 Cadillac Series 60 sedan. From the collection of the California Automobile Museum. August, 2017. A 1953 Chevy Bel Air. The first car I remember my father driving was a slightly later model Bel Air with a simpler paint job, which my parents had purchsed used. My father always bought Chevies. From the collection of the California Automobile Museum. August, 2017. 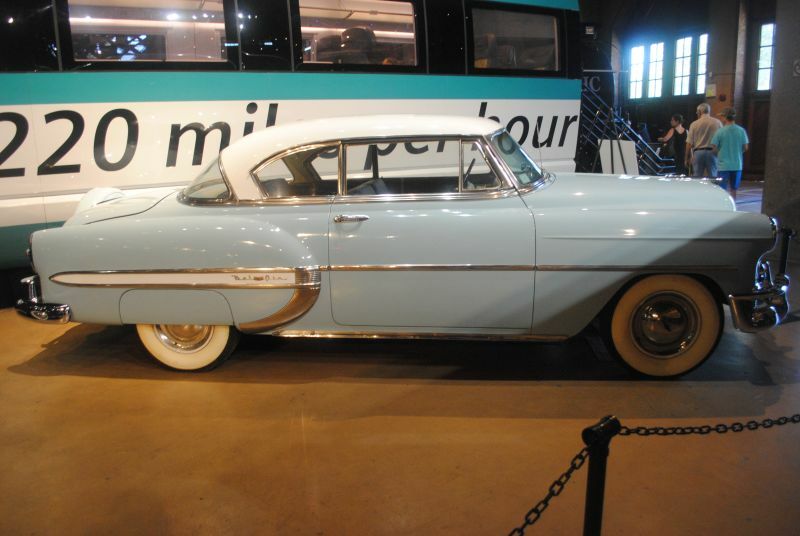 A front view of the 1953 Chevy Bel Air. 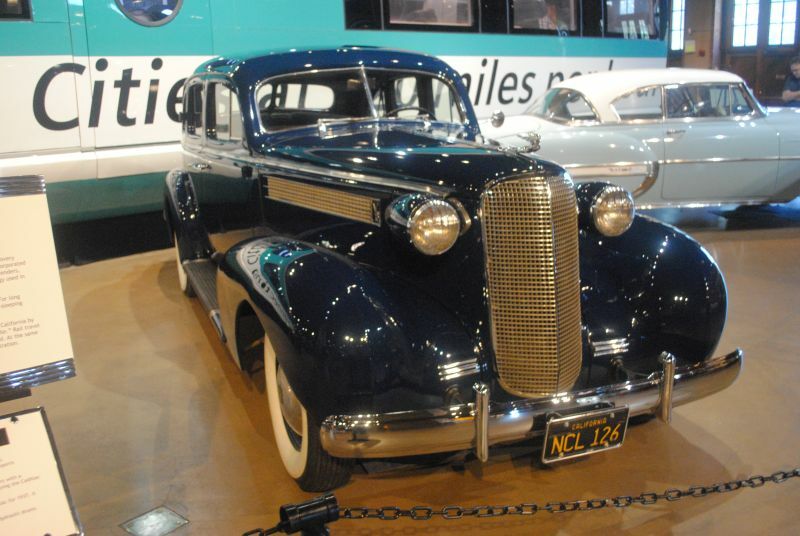 From the collection of the California Automobile Museum. August, 2017.